When my brother was down from Brisbane recently we visited my parents and took the opportunity to go through the stuff in the shed. Both of us have, over the years, salvaged most of our treasured childhood loot but we still have many boxes stashed away. From among the school books, stamp collections and “licky-down books” we unearthed a 1979 Rigby Usborne publication entitled: The World of the Future: Future Cities by Kenneth Gatland and David Jefferis. The front page boasts of “Colonies in Space”, “Solar heated houses”, “Amazing sports” and “Wristwatch TV,” while the salient image is of a sizeable city on the moon, housed in three glass domes. This rather optimistic publication proved to be a time capsule in its own right and was great grist to the mill of one of my favourite subjects – past visions of the future. 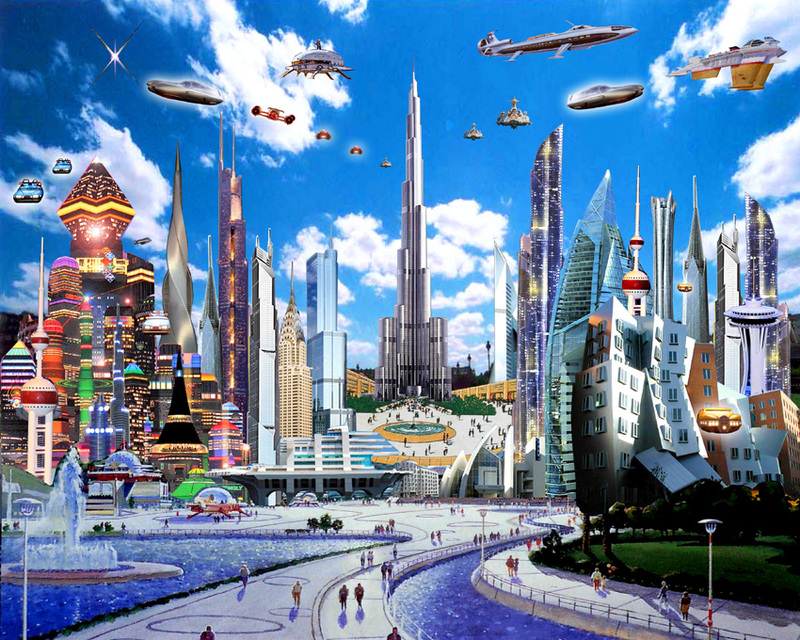 This very idea of imagining how things will look in the future is a relatively recent concept. Most medieval Europeans looked more to the past and sighed at their small stature before the glories of Rome, while in East Asia at the same time, despite advanced technical innovation, societies looked inward, more interested in maintaining traditions than imagining a vastly different future. People certainly dreamed of greater prosperity, but this vision was likely just a wealthier version of the present society, without wholly new technologies and innovations. It is only really since the late Renaissance and the industrial revolution that we have more broadly imagined the idea of a future in which societies were far more advanced technologically. There have long been people who thought up and, in some cases, implemented, radical social shifts, alongside more fantastical, idealistic utopias, but in recent times these ideas have become more wedded to technologies not yet invented or those in a nascent form which promised immense change. Our rate of technical advancement reached such an extreme in the 20th century that, in 1970, Alvin Toffler coined the term “Futureshock” in his book of the same title, which basically posited that humanity was experiencing a psychological condition of culture shock caused by “too much change in too short a period of time.” So accustomed did we become to the whirlwind of advancement and the expectation of radical societal shifts that we were able to imagine an entirely different world emerging within a single generation. These past visions of the future are fascinating in the way they reveal our inevitable naivety as much as our impressive ambition. They show us not only the overzealous hopes of our imagination, but also its limitations. How quaint and pathetic seems the idea of wrist-watch TV, compared to the miraculous multifunctionality of contemporary smart devices. Yet, how utterly ludicrous the idea of a city of ten thousand people orbiting the Earth is in contrast to the three astronauts presently occupying the International Space Station. As for solar-heated houses, at least they were right on this score. Though we may not yet live in a world where we all have solar panels on our roofs, it is a well-established technology with increasingly rapid uptake. This suggests that future houses will rely increasingly on renewables, such as wind and solar; that our communications will increasingly take place via satellite; that we will be driving electric cars and that many home functions might be controlled by a central computer. While electric cars might be slowly arriving, what we now call “the internet of things” – the interconnection of practical electronic devices like fridges, washing machines, dryers, air conditioning – hasn’t really taken off, despite years of talk. Over the page, the arrival of flat-screen, wall-mounted televisions is rightly predicted, though their date of the late 1980s is now recognisably far-fetched. The clunky “TV telephone,” the enormous home computer unit with its antiquated buttons and the drink-dispensing robot reveal, once again, the limitations of our imagination, most obvious in the total absence of anything like the internet. Whereas the “Risto” – a digital watch with unattractive antennae poking out on four sides – is promoted as a “wrist-watch, radio-telephone” that could be used for electronic voting, secure police communication and as a panic-button in emergencies. They also suggest that by “punching out an enquiry number” a lost person could “ask for guidance back to the nearest town.” While the idea that the Risto would rely on something similar to the GPS satellite array is certainly on the money, the inability to conceive of anything as all-encompassing as the internet, makes this all seem rather dull. Perhaps inevitably, the most glaring over-optimism in this book lies in our imagined future in space. Just as Bladerunner, made in 1983, expected much of humanity to be living in off-world colonies by 2019, so this book suggests that the 2020 Olympics might take place on the moon. Unfortunately for the dreamers of the past, the Tokyo games will be all too sublunary. The authors also posit a skyscraper that stretches all the way into space, with vast tubes up which people might travel in shuttles fired along see-through vacuum tubes; a city of 10, 000 people orbiting Earth in one of the gravitationally neutral Lagrange points; space-shuttle refuelling stations; a huge city on the moon with an already well-established industrial sector firing materials into space to build further orbital cities. It goes without saying that none of this has happened, not even remotely. I’ve written elsewhere about how long I expect it will be before any significant human presence is established outside of the Earth – more likely hundreds of years than decades. Sure, a long-desired observatory on the far side of the moon might be possible, and maybe we’ll see five or six people on Mars, but none of this is likely to happen before the second half of the 21st century and, even then, at a stretch. It must be noted however that my projections are based on current levels of investment and the rate of realisation of necessary technologies, whereas, coming off the crest of the Moonshot and Space Race, had the levels of funding that went into the Apollo program been sustained, I suspect we’d at least have several larger space stations orbiting the Earth by now and some sort of minor, token presence on the moon. None of these, however, would be even remotely on the scale proposed in this book. Probably the most silly idea of all, despite coming initially from Carl Sagan, is that of seeding Venus with bacteria and algae to feed on the carbon dioxide and other poisonous gases that blanket the planet, eventually producing enough oxygen to cause water-rain to fall. “It will not get as far as the surface, boiling to steam before it gets there,” say the authors. “But each time it rains, surface temperatures drop a little.” Eventually, they suggest, increasingly heavy rain will scrub the noxious gases from the atmosphere and allow a more Earth-like climate to develop there. I love this idea, but it seems little more than a pipe-dream, as is evident when taking into account all the other problems we would face in making Venus even remotely habitable. Carl Sagan himself later shot down his own plan, in the wake of a more sophisticated understanding of Venus’ atmosphere. I’d like to think that, in the developed world at least, we are moving increasingly towards the garden city idea, but the stubborn persistence in burning fossil fuels, the scale of the human population, the stupidity of post-truth polities who repeatedly elect neo-conservative capitalists intent on burning up the entire planet in the face of an impending environmental catastrophe, makes that future very uncertain indeed. The authors were indeed right about one thing – that it is advancements in technology and increasingly clean and efficient practices which will ensure a better future for us all. I salute their positive vision of a cleaner, greener Earth, which is, in many ways, coming true at a grass-roots level if not at the all-important level of government. Fingers-crossed, the worst-case scenarios of our present visions of the future won’t come to pass, and several decades from now, we’ll be able to chuckle at those pictures of a stifling, suffering world of hunger, conflict and inequality. Stunning Pluto, colour enhanced to highlight different terrain and composition. Like so many people I’ve been completely gripped by the New Horizons mission to Pluto – a gift to humanity that, for the moment, keeps on giving. 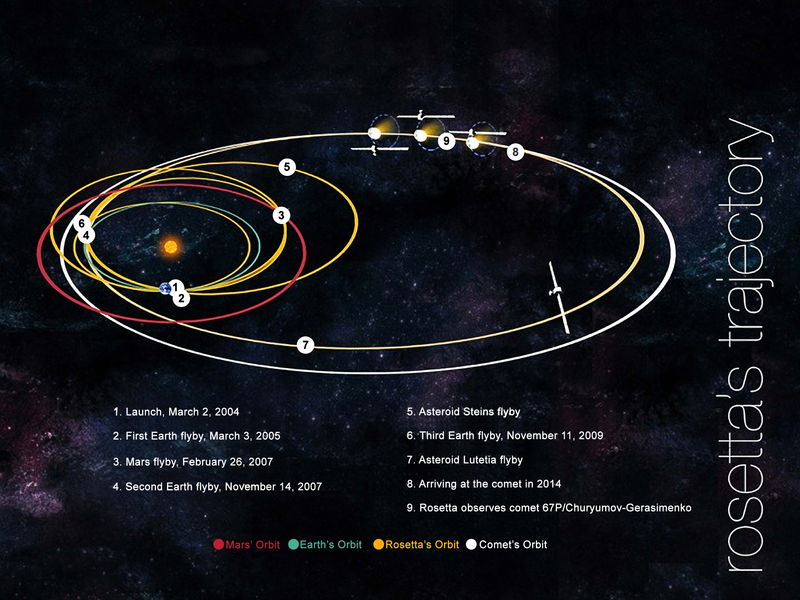 The exploration of the Pluto system completes the initial reconnaissance of our classical solar system, for we have now visited all the planets (putting aside disputes about Pluto’s status) with probes. Though this process really began in 1961 with the Soviet Venera 1 mission to Venus, the probe lost contact before it made its flyby and thus the first successful visit to another planet came the following year, with Nasa’s Mariner 2, which also went to Venus. From that time forward, a quite staggering number of probes have been sent to explore our immediate neighbourhood. Questions are frequently raised about the cost and purpose of space exploration, with a variety of arguments put forward that it is a waste of money. Yet, when we consider the returns from investment in space, scientifically, philosophically and economically, it is clear that such ventures are not only vital to understanding our place in the universe, but also offer many positive outcomes and benefits. Exploration of the solar system not only fills people with a sense of wonder and excitement, it also reminds us just how unique our own planet is and how utterly inhospitable the rest of the planets are – for Homo Sapiens. Ideally this should inspire us to protect our planet – just as the first photographs of the Earth from space were a huge inspiration to green and global peace movements back in the 1960s. Seen from space, it is completely clear that the Earth is one planet we all must share, not some disparate mosaic of places so different that conflict between us must be inevitable. The famous Pale Blue Dot photograph of the Earth taken by the Voyager spacecraft as it left the solar system, in which our home is a mere one pixel against the immensity of space, showed us once again what a tiny oasis we live on. One pixel, that’s all we have, and we really need to stop trashing the joint. The exploration of space may be carried out by national space agencies, and their flag waving may seem parochial, but that is just a reflection of the immense pride in this huge and noble achievement. Space exploration is for everyone – for all humankind. As the International Space Station has shown, when it comes to space, the scientists and astronauts of different nations cooperate with a warmth and eagerness that is admirable, because they know that their work goes far beyond petty nationalisms. Obviously the space program was born of a kind of international competition, but even before the collapse of the Soviet Union, the United States and Russia were working together in space to their mutual benefit, and, arguably, for all our benefits. When Apollo 11 touched down on the moon in 1969, the whole world rejoiced. This was not merely an American achievement, it was arguably the most colossal achievement of the human race’s entire history. A life-form descended from an ape had somehow managed to leave its home-world and travel to another world. Wow. Our exploration of our solar system and the vastness of space beyond has not only allowed us to throw off mistaken ideas about the place of the Earth in the solar system, it has taught us our address in the universe. We are, at present, mapping the entire sky in an attempt to put together a map of the visible universe. We now know precisely where we are in the Milky Way Galaxy and where our galaxy lies in relation to other galaxies in our local group. We now know that at the heart of our galaxy lies a supermassive black hole – Sagittarius A*, around which our unremarkable but life-giving star orbits, along with anything between 100 and 400 billion other stars. We know that our own galaxy is but one galaxy among billions of other galaxies whirling, and it seems, accelerating through space. We know that the universe is not some permanent, static thing, but something that was born and has the potential to die, and is, indeed, expanding. We now know the age of the universe (c. 13.82 billion years); we know the age of the sun (c.4.57 billion years) and the planets (Earth, c. 4.54 billion years). Previously our ignorance of these things meant that we were dominated by superstition, with all the calamities and oppression that religion has brought to humanity throughout its long history. I accept that religion has played an important role in the origins of organised human society, yet its rigid, inflexible and wrong-headed ideas which justify intolerance, autocracy, homophobia, misogyny and genocide have no place in the modern world. Understanding the origins of the universe and of our own sun and planets, understanding how the planets and stars move in space and understanding how all this can be attributed purely to the laws of physics is helping us to throw off the shackles of these restrictive and punitive beliefs. Further exploration can only push superstitions about our origins and those of the Earth itself to the margins, and, in the context of the recent barbarism in the name of religion and widespread ignorance that denies the reality of climate change, this can’t happen soon enough. By no means has all of this been done through space-based probes, but exploration of the universe began, of course, with the human eye and telescopes. In recent decades, however, the ability to deploy telescopes to space has greatly improved our knowledge and vision of the universe. 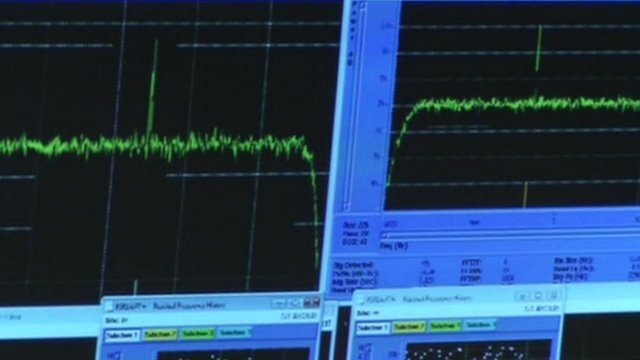 Indeed, since the 1970s, more than eighty probes have been sent into Earth’s orbit and beyond measuring our planet, the solar system, galaxy and wider universe in gamma rays, x-rays, visible and infrared light, microwaves and radio waves. The new telescopes being developed for deployment on both Earth and in space, the Square Kilometre Array, the James Webb Telescope, the Transiting Exoplanet Survey, the Giant Magellan Telescope, and the “imaginatively” named Thirty Meter Telescope and the European Extremely Large Telescope to name a few, will allow us, for example, to find planets in neighbouring star systems with an accuracy of which we have only dreamed. This is key information not just for refining our understanding our origins and how unique or typical our planet and planetary system is in space, but also for developing maps of our neighbourhood which may one day be necessary should we ever need to look beyond our solar system for a new home, or indeed, be driven to colonise the other planets in our solar system. Such distant outcomes seem almost pointlessly farfetched, yet the knowledge and wisdom we gain from this – the insights into questions as fundamental as the prevalence of life in the universe, whether or not we are alone, and whether or not we can one day expand our horizons, come at such a relatively cheap price that it would be foolish not to gain this knowledge. Humans have, after all, always looked beyond the horizon. It’s how we colonised our own world in the first place. Such high minded motivations aside, there are also huge economic and environmental benefits which derive from space exploration and the space program. Consider all the technological spin-offs that have come from the space industry in the past – it’s a very long list, but here are a few highlights – solar cells, chemical detection devices, scratch resistant plastic, anti-icing systems for aircraft, light-emitting diodes, fire-fighting equipment, water purification, cordless tools, powdered lubricants, air-pollution extraction, freeze-drying, improved heart pumps, robotic artificial limbs, invisible braces, improved insulation materials… Many other technologies which already existed have been refined and improved by scientists working on space programs. Take for example the chemical detection devices used to sniff out gases on other worlds or deep space – these “artificial noses” have a huge range of actual and potential applications on Earth. Our knowledge of our own planet, particularly with regard to our understanding of the climate, atmosphere, and surface and ocean temperatures has expanded enormously thanks to an ever-growing list of Earth-observation satellites. 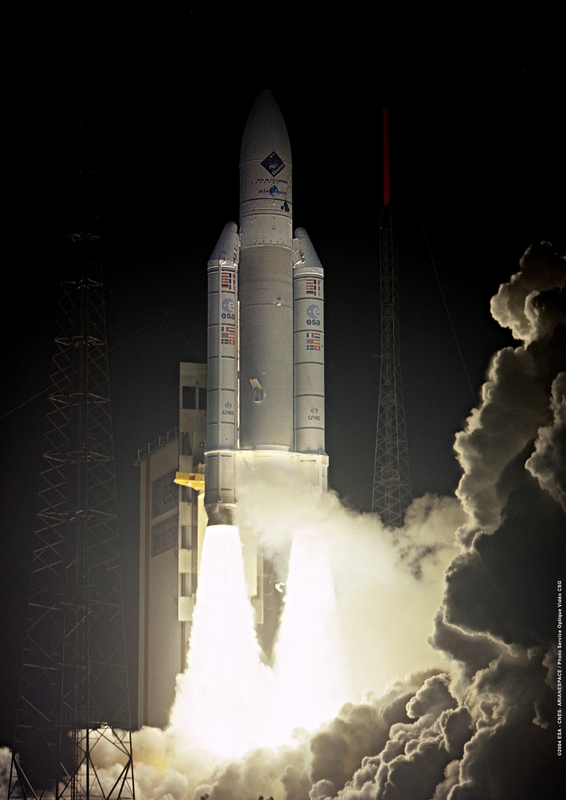 Such programs as the ESA’s Copernicus Program, which has already launched two of six planned satellites to observe weather, vegetation, soil and water cover, inland waterways and coastal areas, atmospheric temperatures, will allow us to foresee and predict changes on our own planet and help us to act accordingly. Arguably, such satellites might be considered more vital and practical than those visiting other parts of the solar system, yet even these programs attract similar questions about the value of the investment. Serving society indeed. Hear hear! Rather than raising questions about spending money on science such as this, people should really turn their attention to the million and one other things humanity wastes its money on and question those priorities first. Consider, for example, the billions of dollars given in subsidies to the fossil fuel industries; the tax breaks dolled out to the hugely wealthy and to religious institutions, the opulent waste of our overconsumption, the recent bail-out of banks and the horrifically expensive and destructive wars we fight. Investing just a fraction of this waste in cutting-edge research would advance humanity’s interests enormously and move us into a cleaner, greener future. As someone who believes in a strong state system where wealth is taxed sufficiently to provide high quality services to the entire population and fund intellectual, artistic and humanitarian endeavours, it goes without saying that the first priority of a government should be bread and butter portfolios such as health and education. Yet, with adequate taxation there should be plenty of money to fund space exploration and space-based research, along with all other viable fields of enquiry. 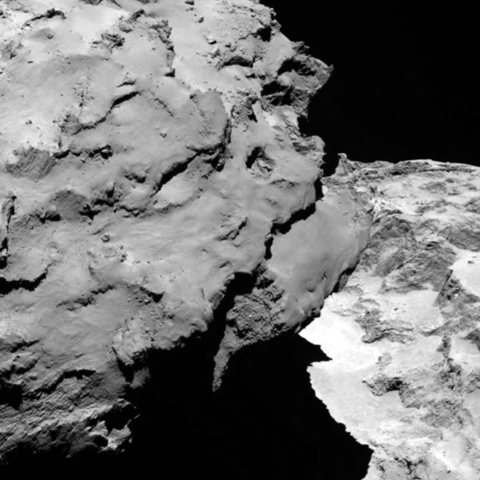 Space exploration is, at the end of the day, not that expensive. The Curiosity rover is a ground-breaking, prestige mission that has put a plutonium-powered, multi-functioning, mobile robotic laboratory on Mars which could potentially continue to explore the red planet for the next fifteen years – and it cost only 2.5 billion dollars. As a lump sum, this may seem a lot of money, but then, consider the fact that stealth bombers cost two billion dollars each and the US has, to our knowledge, built 21 of them. Unlike the Curiosity rover, they are not helping us to consider fundamental questions such as whether or not life may have first originated on Mars. It must be said that investment in military technological development has also produced a long range of admirably useful and important spin-off technologies. Yet such research could just as easily be conducted with peaceful, civilian purposes as its primary goal, and the cost of military hardware is outrageous to the point of scandalous, when we consider the destructive application of these machines. Not only does such research benefit us, it makes a net profit. At present, defence spending in the US accounts for 24.5% of total spending, whereas NASA’s budget equates to 0.5%. Adjusted for inflation, the Apollo program cost one twentieth of the 2.4 trillion dollars spent on the wars in Iraq and Afghanistan. While the Apollo program employed roughly 409,000 people, many of whom gained ground-breaking experience in the development of new skills and technologies, the two wars led to the deaths of more than 150,000 people and practically bankrupted the United States. It may not be an equitable comparison, but it gives a pretty clear sense of where money might be better spent. And consider this – because of the high-end, high-value tech spin-offs that come from NASA and associates, it is estimated that for every $1 invested, between $7 and $14 are generated, which is a pretty neat profit however you look at it. 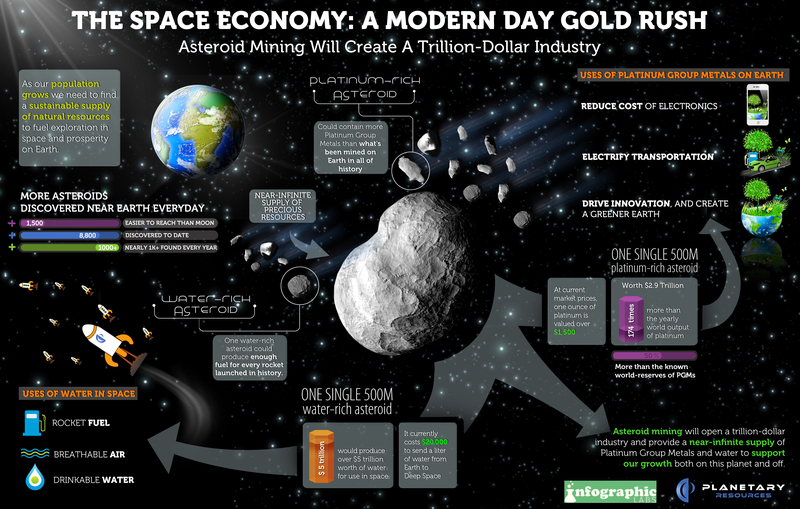 Many start-up companies are now working towards developing asteroid mining industries. As difficult as the task might prove to be, the benefits could be incalculable. Asteroids in our neighbourhood contain enormous, untapped deposits of rare and important minerals of which we have but a finite amount on our own planet. Potentially, these minerals can be extracted in space and transported to Earth without destroying our own vital ecosystems. If the industry ever manages to get off the ground, we could one day see an end to mining on Earth and instead gain all our mineral needs from space. What a relief this would be for our fragile environment. Knowing what is out there in the first place allows us to imagine such alternatives. These are just some of the practical benefits of space exploration, put in harder, economic terms. Yet in truth, the real benefits we gain from this exercise go far beyond anything as tawdry as money. Space exploration is a source of great wonder and inspiration and it is a important way for us to contextualise ourselves and our existence, in the vastly wider and utterly indifferent cosmos. The Cassini probe has been studying and photographing Saturn and its moons since 2004, and has provided us with some of the most breath-taking images of the solar system’s beauty – the tiger stripes of Enceladus, the hydrocarbon lakes on the surface of Titan, the strange blue hexagon at Saturn’s north pole. 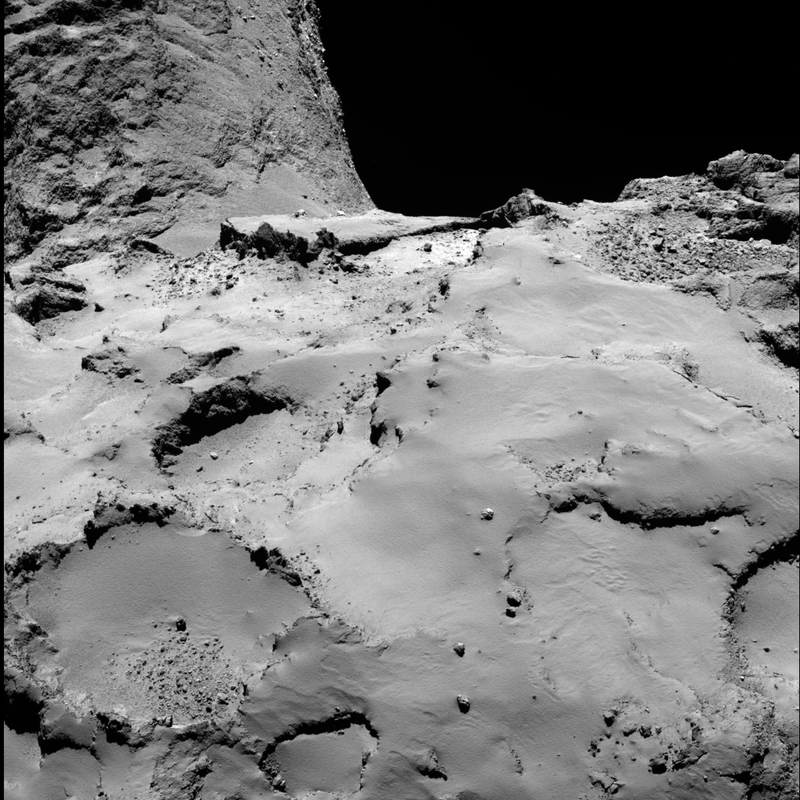 Space exploration offers immense pleasure through the discovery of beautiful things. Beautiful Enceladus could harbour life in its tidally-heated subsurface ocean. Hydrocarbon lakes seen in a rare glimpse through the haze of Titan. No one expected Pluto to look as beautiful as it does. 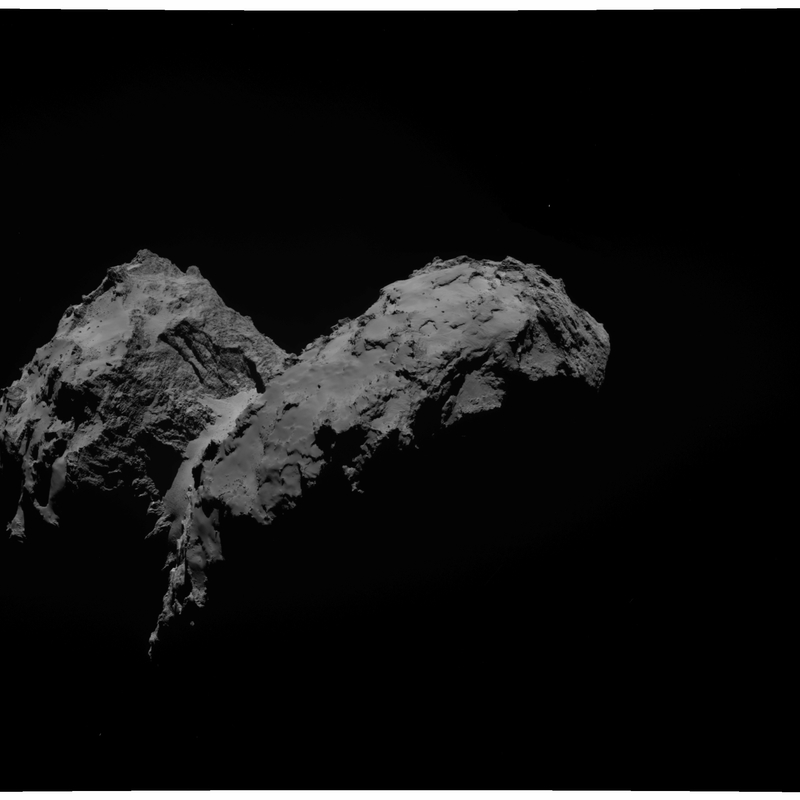 Even the most enthusiastic planetary scientists would have thought you were smoking crack if you told them they’d find tall mountains of water ice and flowing glaciers of frozen gases on a geologically active world, or a hazy, blue nitrogen sky. The sheer beauty of this distant world has made our lives richer and we can only see these images because we made the effort to go there. I say to anyone who doubts whether or not the small price paid for this mission was worth it to take a really good look at the picture below, in high resolution, on a very wide screen. Science fiction, eat your heart out. 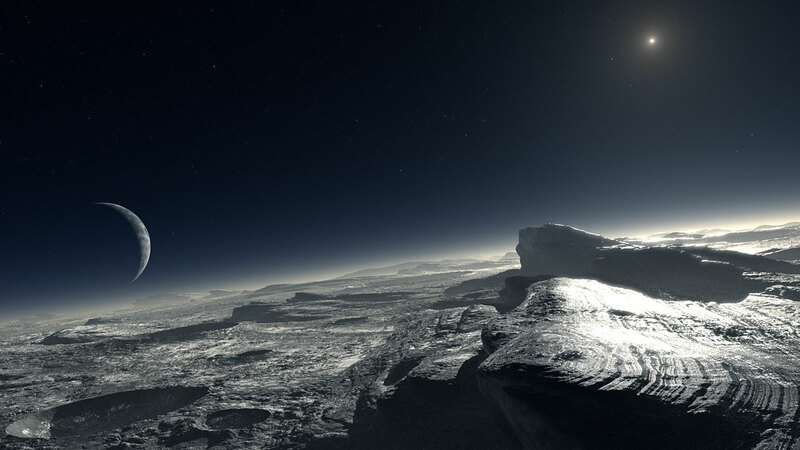 Pluto, a fantasy wonderland of gloriously active geology. The ability to throw accurately and at high velocity is a uniquely human trait. 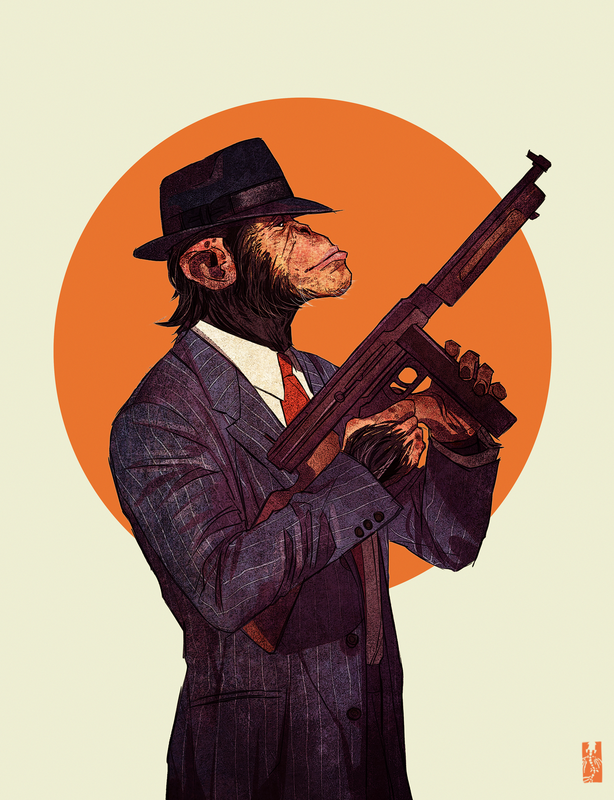 Other primates don’t even come close to our range, speed and aim. The chimpanzee, despite being immensely strong physically, can only throw at around 20 miles per hour and is not especially accurate. A twelve-year-old human child, on the other hand, can achieve more than three times that speed and a far sharper aim. The ability to kill from a distance wrought changes in the lifestyle and diet of early humans by revolutionising their capacity to hunt and to defend themselves. This not only had significant physical and developmental impacts, it also had social, psychological and moral implications as well. The capacity for a weaker individual to slay a stronger one without engaging in physical contact must have transformed early human social relations. To be able to kill at a distance in the first place, early humans had to learn how to throw effectively, and this is something they did to a quite astonishing degree. 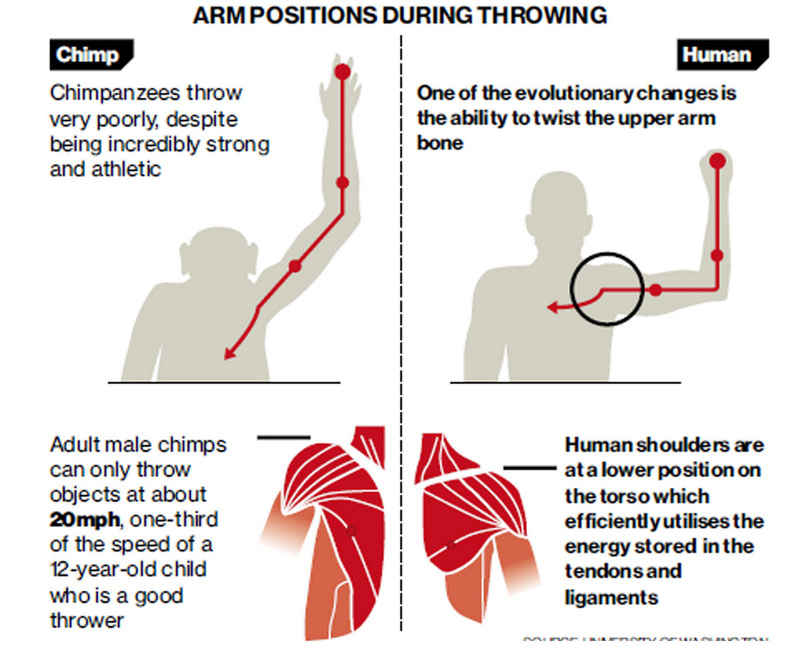 The adaptations that enabled such fast and accurate throwing began to develop around two million years ago in Homo Erectus. The key changes, as identified recently in a study by Dr Neil Roach of George Washington University, were a wider waist, the lower position of the shoulders on the torso, and the capacity to twist the upper arm bone. Studies tracking the movement of American baseball players clearly illustrate how the human shoulder works like a slingshot by storing and releasing energy in its tendons and ligaments, allowing humans to hurl projectiles with incredible and deadly speed. The action of throwing begins by first rotating the arm backwards, during which movement elastic energy is stored in the shoulder. When the arm rotates forward, that energy is released in a lightning motion and transferred through the arm to the missile. It is hardly surprising that this throwing action became so greatly refined and specialised, considering the enormous advantages that it offered. Indeed, one could argue that learning to throw quickly and accurately drove human evolution more powerfully than any single factor outside of upright walking and language. The morphology of organisms is determined by a number of environmental factors, and one of the most key is how they acquire their food and defend themselves. Hence long beaks and tongues for dipping into flowers; huge teeth for grinding bone; incredible speed for chasing or fleeing; sharp claws for climbing or rending flesh, venomous bites for attack or defence – the diet and the nature of external threats drives the design. If you studied the morphology of hominids over the last two million years and asked, how do these creatures acquire food and how do they defend themselves? – the most obvious answers would be by running, climbing and throwing. Focussing on diet, we then might ask – which of these techniques provide the most protein? – and throwing is the obvious answer. Those more capable of throwing not only made considerably better hunters and had a wider variety of meat available to them, they were also better adapted to seeing off rivals in a dispute. Once humans began to rely on throwing as a key hunting technique, natural selection ensured that those better adapted to throwing passed on their genes. Consider how natural the inclination is for people to practise throwing and to gain pleasure from it. Just as other animals chase, spar and wrestle in play as a kind of innate training program for skills they will need in adulthood, so almost all human children practise throwing from a young age and derive immense pleasure and satisfaction from their accuracy and skill. We are designed to throw – it is the only explanation as to why we are so good at it. Once early humans began to hurl rocks and spears, there was no looking back – it was, quite simply, the best means by which to acquire rich sources of protein. Being able to take down prey at longer range meant access to a great deal more meat, providing more fuel for growing brains and supporting larger social groups. The skill itself must have driven brain development through the complex calculations required to judge a throw – distance, angle, height, wind-speed, tracking the prey’s movement and knowing exactly when to release. The ability to make aerodynamic spears, or choose the most effective stones must also have called upon significant brain power and encouraged manual dexterity. The range and variety of habitats available to early humans would also have changed dramatically. No longer required to stay near rich sources of fruit and vegetables, or to use the cover of the woods to surround and ambush prey, early humans were free to enter new habitats, acquiring their food through long-ranged attacks on the herds grazing the savannahs. The point at which early humans first began to rely on missile weapons has long been debated by archaeologists. Whereas the evolutionary adaptations begin to appear almost two million years ago, archaeology can only provide much more recent evidence for the use of throwing spears, with dates ranging from less than 100,000 years ago, to half a million years. Indirect evidence derived from impact fractures on spear tips suggest people were throwing spears at least as far as 500,000 years ago, but this interpretation is widely disputed and it is difficult to determine conclusively whether spears were thrust or thrown. The failure of wood to preserve well means we lack sufficient evidence and, as the dictum goes, absence of evidence is not evidence of absence. 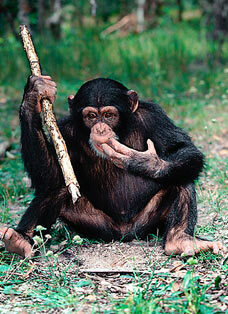 Chimpanzees are well known for using a variety of simple tools. 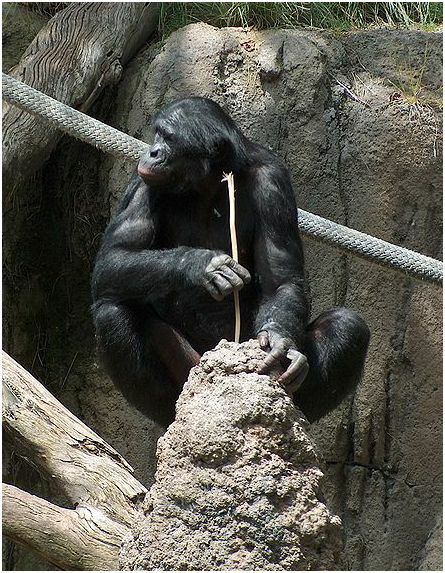 Poking sticks into ant and termite nests to collect insects, breaking nuts with rocks, and, it seems, even attempting to spear smaller primates with sharp sticks. This latter behaviour is, evidentially, rare, and chimpanzees are not known for throwing spears or using them in combat or hunting. Yet it doesn’t take much imagination to consider that if an ancestor with whom we parted ways some seven and a half million years ago uses such technology, then early humans might have taken the sharp stick a few steps further and started throwing them at creatures. On these grounds some anthropologists have suggested that hominids may have been using spears as weapons as early as five million years ago. Whatever questions may hang over the archaeological evidence, it seems the only place we need look to determine when early humans began to use throwing as a principal means of hunting is the biology. If the adaptations were there two million years ago, then surely this is because early humans were increasingly throwing things two million years ago – it’s the only logical explanation. It is hardly likely to have just been for play, or courtship – the most logical driver is the benefits it offered in food acquisition and self-defence. 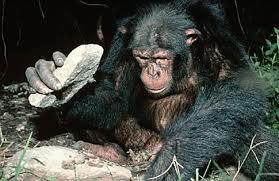 As to what those early humans were throwing, it is hard to be sure. They likely began with rocks, possibly for dislodging things from trees, before graduating to more refined and aerodynamic missiles. The huge competitive advantage offered by this skill ensured that humans were able to dominate their environment. It may also have played a significant role in developing the codes of ethics and morality which kept inter and intra-clan strife to a minimum. Dominant males could no longer rely on brute strength and intimidation alone to see off rivals. The knowledge that a weaker, less dominant individual – male or female – could, through a carefully aimed spear, assassinate them, would have transformed the social landscape. More tact, more consideration, more rigid rules might well have emerged in the wake of developing such deadly capability. 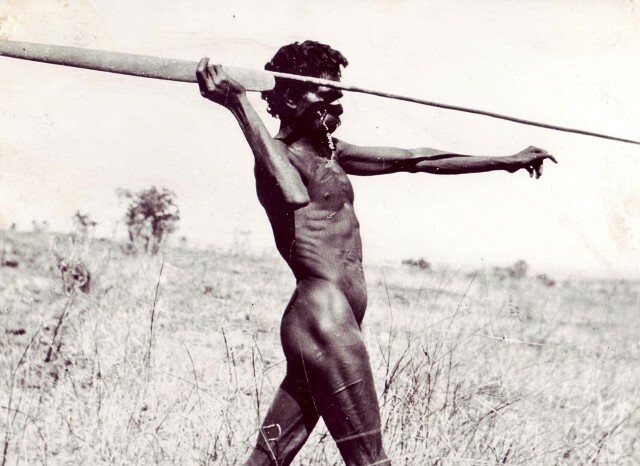 From the humble rock and primitive throwing spear, humans later took their ranged attacks to new heights through the development of better spears, then spear-throwers – Atlatls and Woomeras – and ultimately, bows and arrows, for which the earliest archaeological evidence dates to roughly 13,000 years ago. Some have suggested that these technological advances might in part explain how Homo sapiens outcompeted Neanderthals, but, like so many theories on that front, it is based on a number of assumptions and guesses. 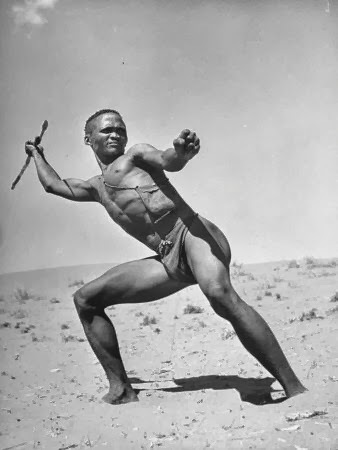 Even without the use of spear-throwing implements, which have been shown in tests to have an effective, accurate range of between 45-55 metres, with a maximum range considerably longer, it is possible to hurl a spear a significant distance. 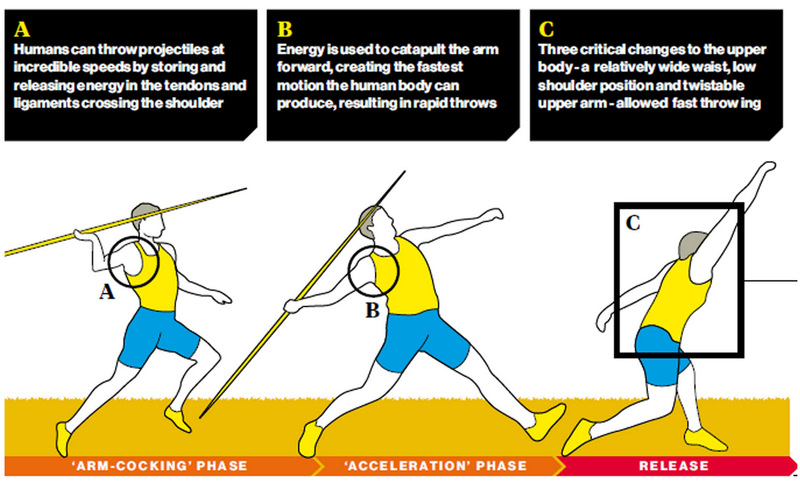 The Olympic javelin record is just under a hundred metres, and whilst no one would suggest such ranges were achievable or desirable with prehistoric weapons, light, wooden spears can be deadly at tens of metres, allowing the hunter to keep a very significant gap between prey – or predator for that matter – especially when the prey failed to perceive that such a distant human could be a threat. 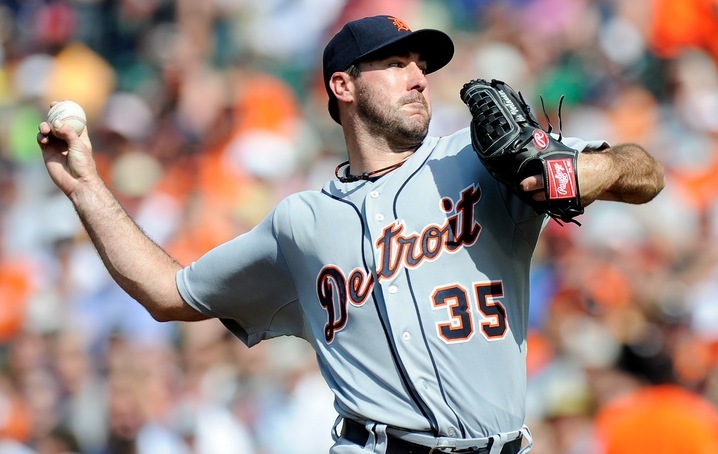 Whatever the case, the development of throwing is one of the main reasons we are here today. It is one of our most refined skills, and for millennia, likely for millions of years, it remained our species’ preferred means of hunting and acquiring food. That we are so good at throwing is no accident – it is simply natural selection favouring the genes of the better hunters. The preying mantis uses lightning speed, the snake has deadly venom, the honeybee favours a suicidal sting and we humans have missiles – that’s just how we roll. 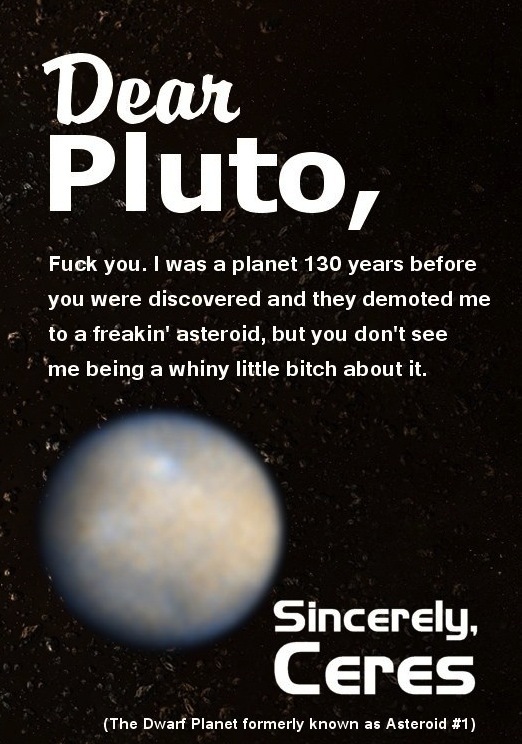 The demotion of Pluto as a planet back in August 2006 caused a great stir and left many people feeling disappointed. 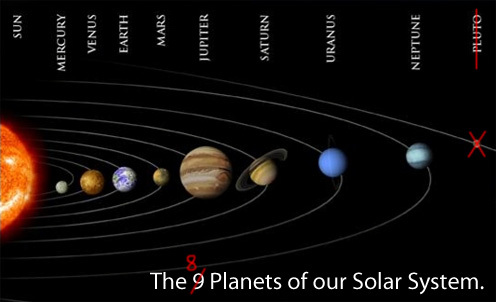 Since its discovery in 1930, several generations have been taught that there are 9 planets in the Solar System, no more, no less. Considering how sophisticated our knowledge of space and our own planetary system has become, it must have seemed as though this were a fixed figure, unlikely to change. After all, could there really be other planets out there that we had somehow missed? 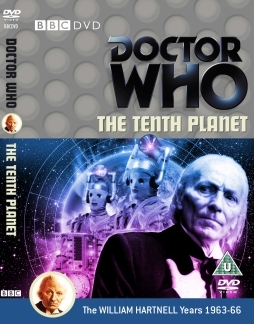 Science fiction has made much of the idea of “the 10th planet,” yet with no other planets apparently introduced to the ledger since 1930, was it likely that any further planets were going to be discovered? And, perhaps more pertinently, what could possibly cause a planet to lose its status as a planet? What actually is a planet? The answers to all this should excite anyone who has an interest in astronomy and offer more than mere solace to people mourning the demotion of Pluto. For, in recent years, many more planets have been discovered in our solar system – or, rather, many more “dwarf planets” have been discovered, and it was the discovery of another distant planet that is, in effect, larger and heavier than Pluto, that led to Pluto’s demise. Of course, Pluto isn’t going anywhere, not in a hurry, anyway, considering it takes 247.68 years to orbit the sun, but it now bears the status of “dwarf planet”, precisely because, if we were to accept it as a planet, we would have no choice but to welcome many more planets to the roster. This in itself might not be such a bad thing, considering how little known most of the newly discovered planetoids / dwarf planets are, but the lengthy debates about what constitutes a planet did set out some sensible ground rules for planetary status, even if these rules remain hotly disputed. 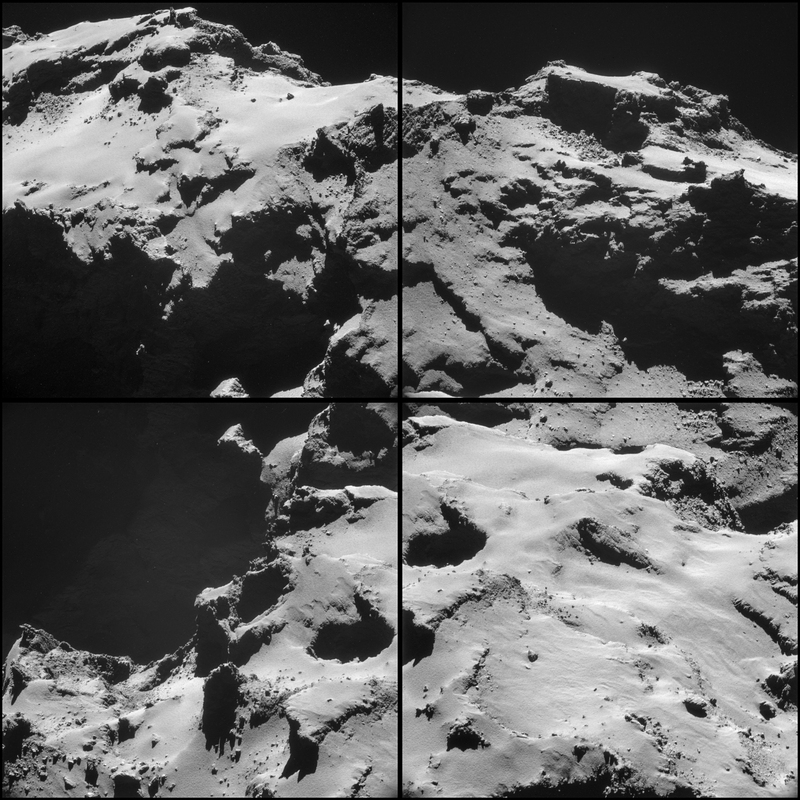 has “cleared the neighbourhood” around its orbit. the object is symmetrically rounded into a spheroid or ellipsoid shape, where any irregular surface features are due to a relatively thin solid crust. In other words, the product of things like tectonic forces, rather than simply being wildly out of shape. Earth is round (well, slightly ovoid) Mars is round and even Pluto is round. 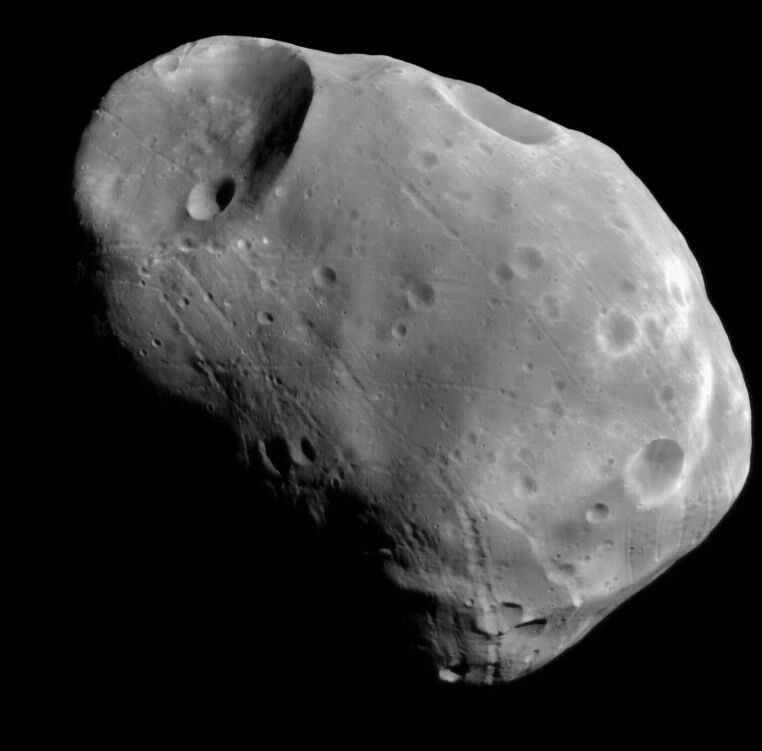 If it doesn’t look like a deformed potato – such as Mars’ moon Phobos – then it has passed the second hurdle of planet-hood. Otherwise, we would simply designate it an asteroid or minor planet (explained below). Not listed above, but best mentioned now because it marks the other boundary of planetary size and mass, is a further necessary rule of planethood – that it not be massive enough to cause thermonuclear fusion. In the end stages of planet formation, a planet will have “cleared the neighbourhood” of its own orbital zone, meaning it has become gravitationally dominant, and there are no other bodies of comparable size other than its own satellites or those otherwise under its gravitational influence. In other words, if a planet is a planet, it must be the only object, apart from its moons, to follow the same orbital path – a lone car on an otherwise empty highway. Mercury does this, Venus does this, Earth does this, but Pluto does not do this. If we think of the asteroid belt, the very name “belt” says it all. It is a space in which many objects share the same orbital path and no one object dominates with its gravity. Indeed, if one object did do this, then what would have to happen is that the objects in the same orbital path would have to be drawn together, colliding to form a new planet, or fall into orbit and become moons of the new planetary body which formed from the rest of the material. A large body which meets the other criteria for a planet but has not cleared its neighbourhood is classified as a dwarf planet. 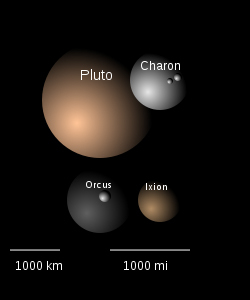 This includes Pluto, which shares its orbital neighbourhood with Kuiper belt objects such as the plutinos. The Kuiper belt, incidentally, is a region of the Solar System beyond the planets which begins at the extremities of Neptune’s orbit. Neptune orbits at roughly 30 AU (1 Astronomical Unit = the distance of the Earth from the Sun) whilst the Kuiper belt extends as far as 50 AU from the sun. 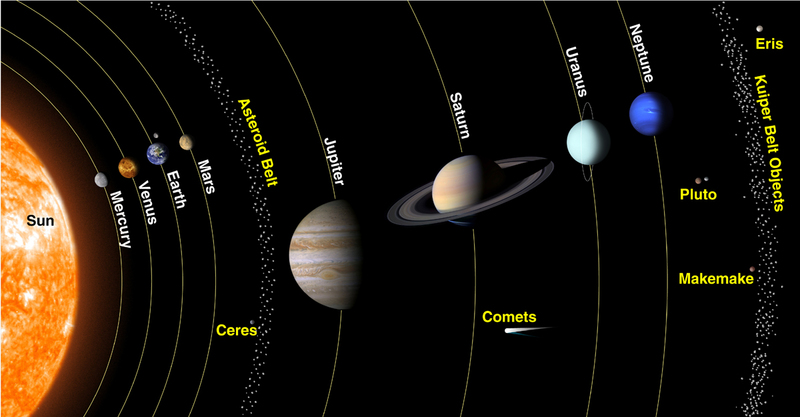 It is not unlike the asteroid belt, but it is much larger – 20 times as wide and roughly 20 to 200 times as massive. 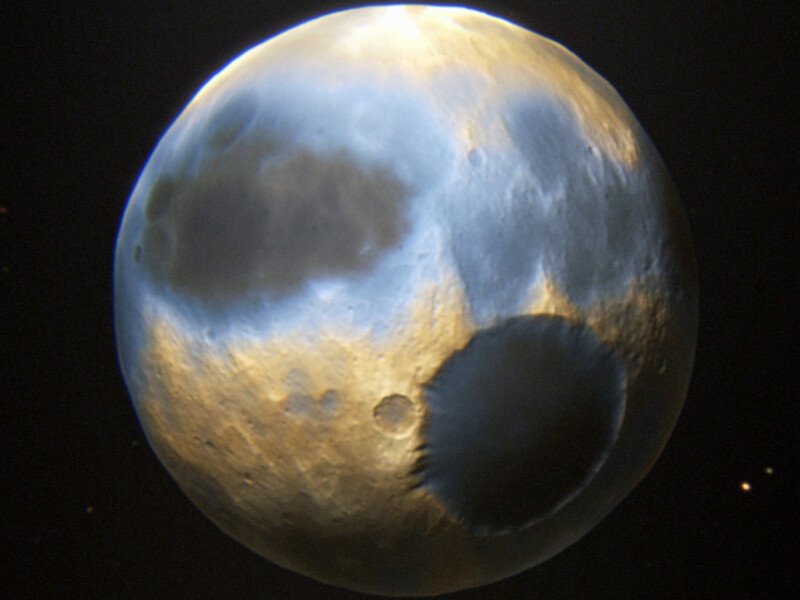 It consists of remnants from the Solar System’s formation – in other words, pieces of rock and ice of varying size which did not come together to form planets, or which did come together to form dwarf planets or minor planets – planets which then failed to achieve sufficient size and mass to clear their orbital path. No doubt you’re also wondering what a plutino is. In effect, they are objects which are caught in a 2:3 mean motion resonance with Neptune. 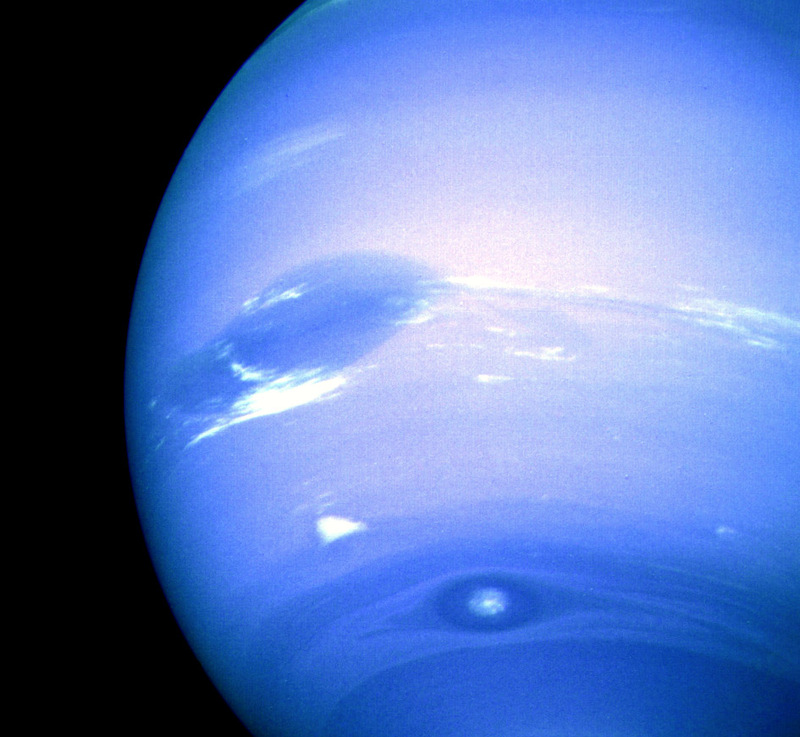 In other words, for every two orbits that a plutino makes, Neptune makes three. They share the same orbital resonance as Pluto and follow a similar path. Indeed, it was the discovery of the plutinos as much as anything else that led to Pluto’s demise. Pluto has not cleared these from its orbital path. So where does all this leave us? The truly exciting answer is that we are left with a surprisingly large number of dwarf planets in our Solar System. 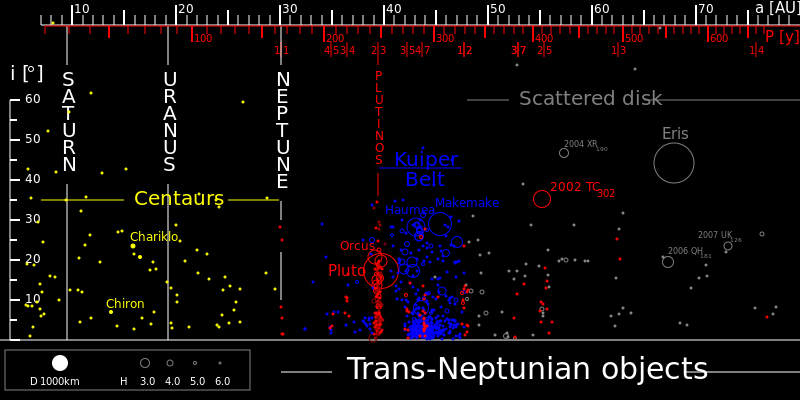 Those which orbit beyond Neptune, in the outer Solar System, are included under the rubric of trans-Neptunian Objects (TNOs). To our knowledge, there are no less than 620,000 TNOs, but before we get too excited about this figure, it must be said that this number is not for dwarf planets, but rather another categorisation: Minor Planets. Minor planets include dwarf planets, asteroids, trojans, centaurs, Kuiper belt objects, and other trans-Neptunian objects. Ignoring the other categories, let’s focus instead on how many dwarf planets have so far been identified in total, not just in trans-Neptunian orbits, though this is where most of them reside. 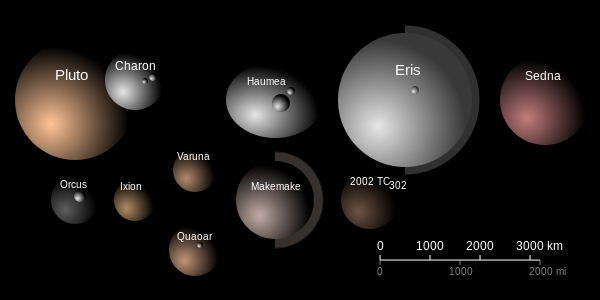 At this stage the IAU has definitively named five dwarf planets: Ceres, Pluto, Eris, Haumea, and Makemake. 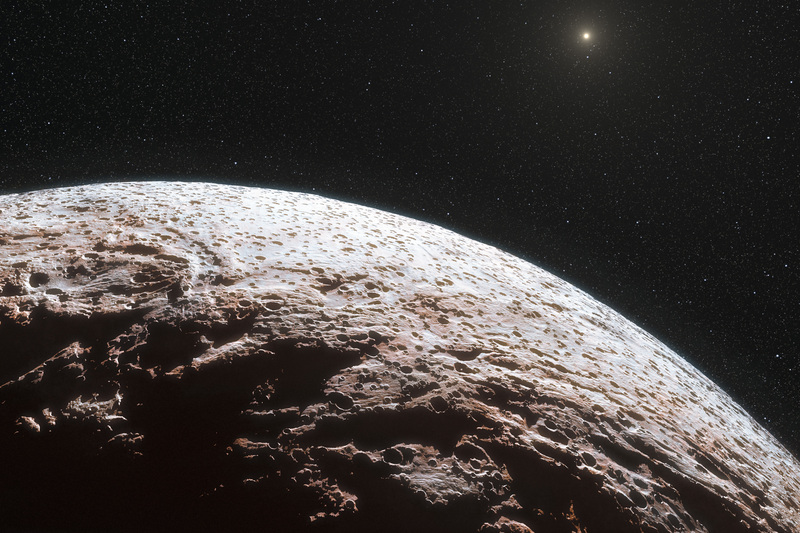 A further six, which in all likelihood are dwarf planets, have been discovered and await official recognition: Orcus, Sedna, Quaoar, Salaci and the less charmingly named 2002 MS4 and 2007 OR10. Another twenty-two objects have been identified which need further observation to determine whether or not they achieve dwarf planet status. So, rather than a mere 8 or 9 planets in our Solar System, we may potentially include as many as 30 dwarf planets roaming around out there. 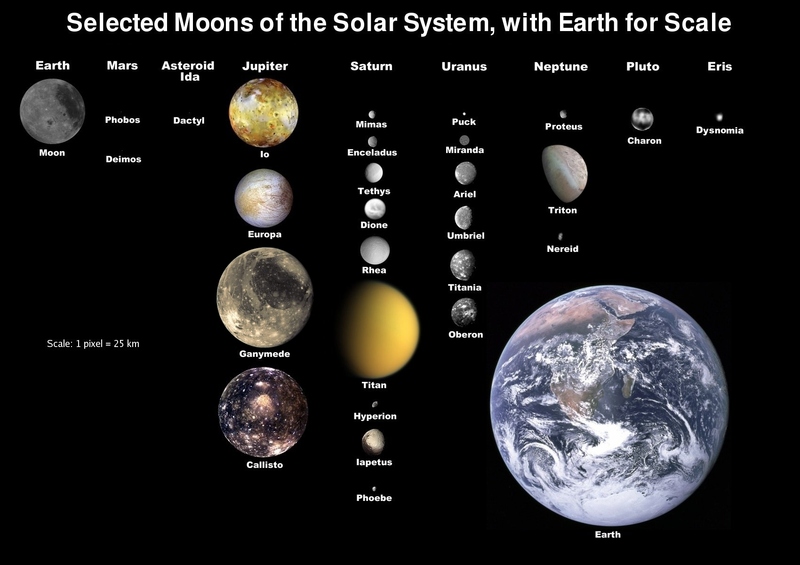 I am deliberately ignoring the 19 moons in our Solar System, including our own, which are large or massive enough to achieve dwarf planet status (7, in fact, are more massive than Pluto: the Earth’s Moon, Io, Europa, Ganymede, Callisto, Titan & Triton) yet which clearly fall short on account of their orbiting other planets and not orbiting the sun. 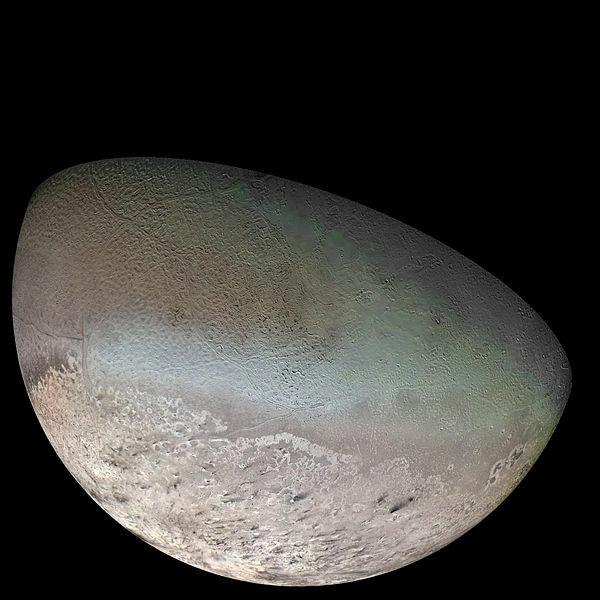 Incidentally, Triton, Neptune’s largest moon, is the only large moon in the solar system with a retrograde orbit – in other words, it orbits in the opposite direction to the planet’s rotation – and is almost certainly a Kuiper belt dwarf planet that was captured by Neptune’s gravity. It is also worth noting that, as impressive as the number of dwarf planets discovered so far may be, the IAU estimates that there might be as many as 200 dwarf planets in the Kuiper belt alone, and, wait for it, anything up to 10,000 in the region beyond. 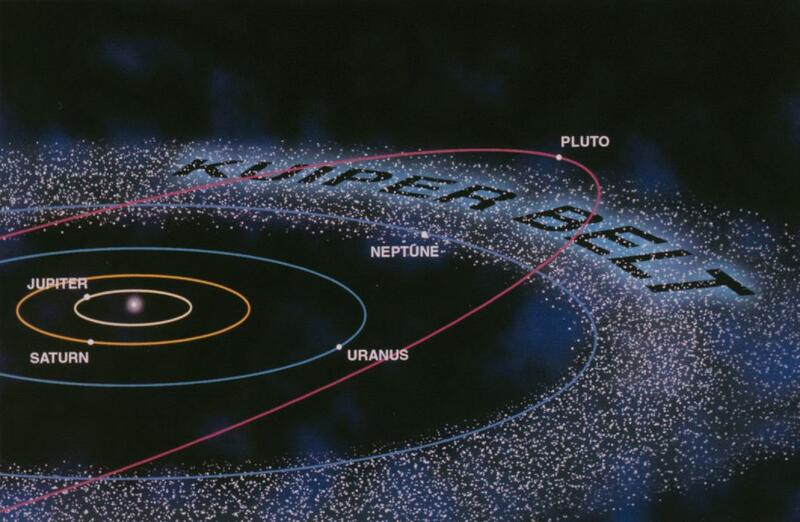 So what is beyond the Kuiper Belt? Well, remember how big space is, and here I am inclined to quote Douglas Adams: “Space is big, really big. 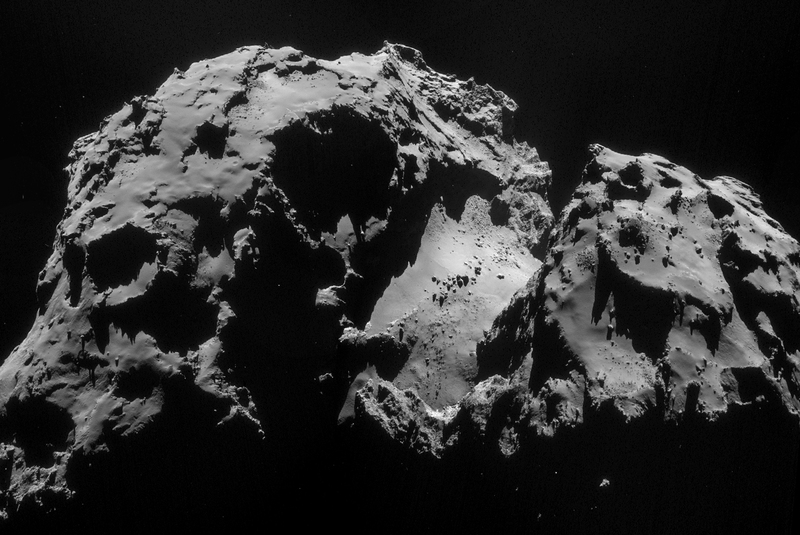 You just won’t believe how vastly, hugely, mindbogglingly big it is. I mean, you may think it’s a long way down the road to the chemist’s, but that’s just peanuts to space…” Well, the solar system itself is also really big. The sun, an otherwise unremarkable star amongst billions, exerts an influence across a region that likely extends as far as 50,000 AU – roughly one light-year from the sun itself, though some are even willing to speculate that its influence extends loosely as far as 200,000 AU. 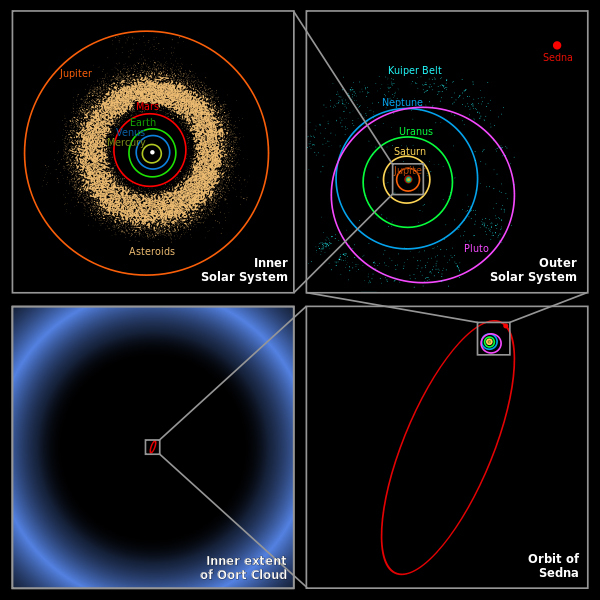 The Kuiper belt is but a tiny narrow region by comparison to the Oort Cloud which surrounds and embraces the entire Solar System, as the image below makes clear. We shall talk about Sedna later. 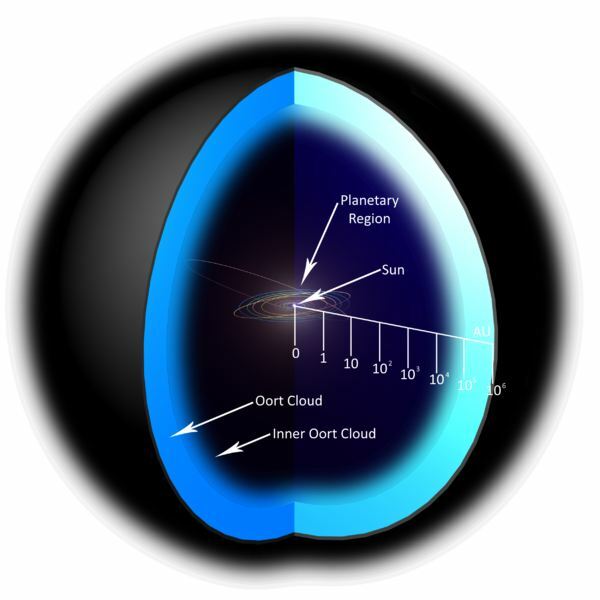 Exactly what lies in the Oort cloud is anyone’s guess, though we needn’t assume it is anything alarmingly different from what we find in the Kuiper belt or asteroid belt for that matter. 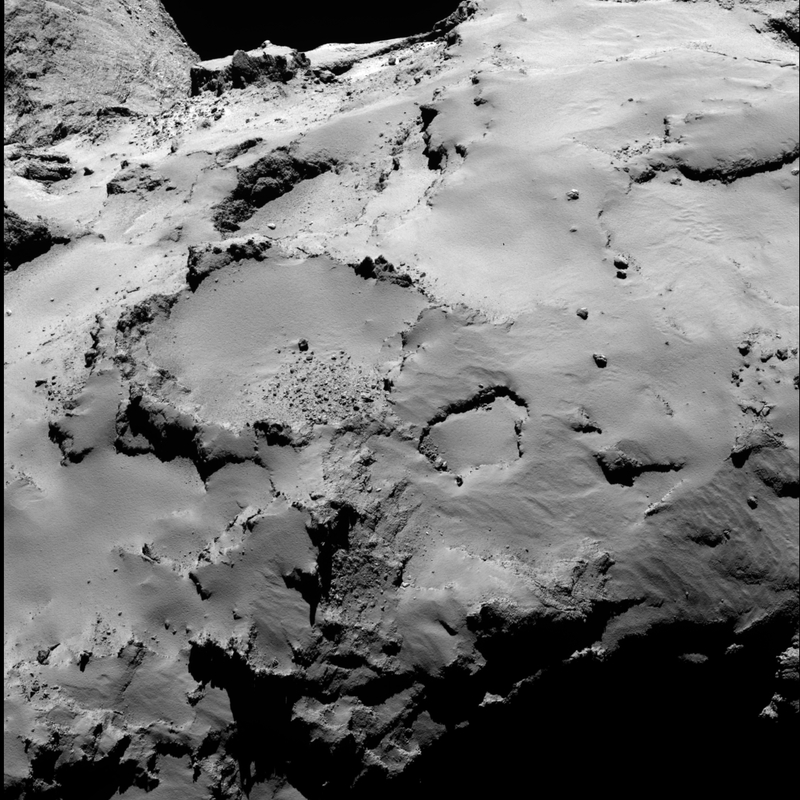 It is just another vast sea of rock and ice, and the likely point of origin for most comets which enter our inner Solar System. Yet, I don’t wish to digress too far into the lesser known outer regions of the Solar System, which it is not feasible to explore adequately in the immediate future. 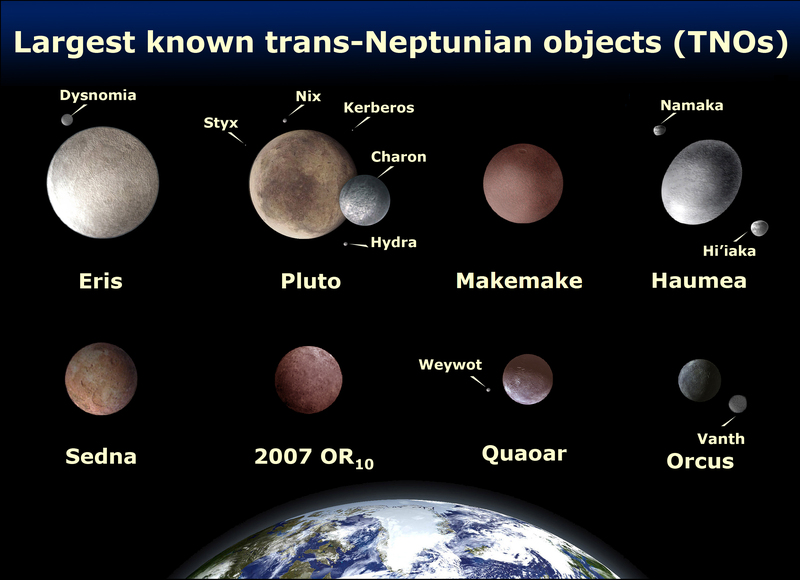 Instead, let’s turn our attention to some of the exciting new (and not so new) dwarf planets that have been identified. We must begin with Eris, which is, in effect, the key player in the drama surrounding Pluto’s demotion. It was with the discovery of Eris in January 2005 that astronomers decided they needed new rules for determining exactly what constitutes a planet. 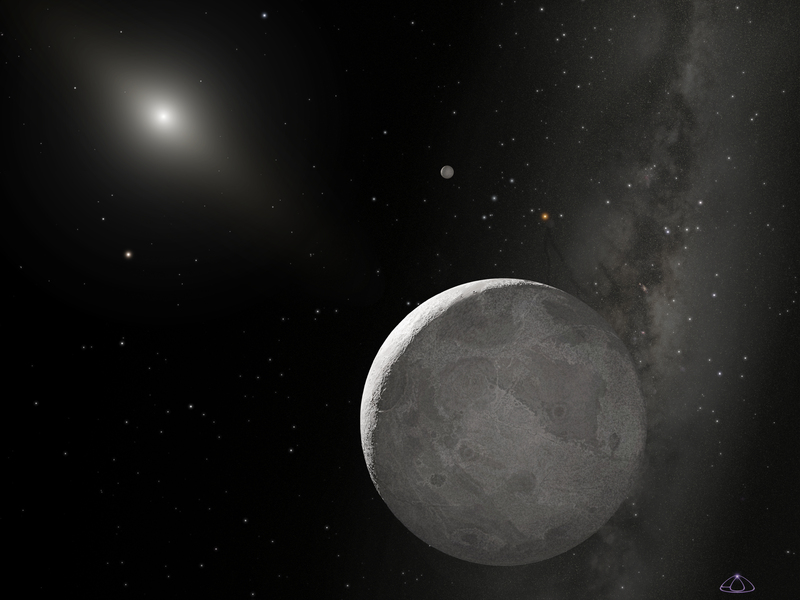 Eris is actually larger and heavier than Pluto. At roughly 2336 km in diameter and just over a quarter the mass of the Earth, it is by no means an insignificant little rock. On account of its size, Eris briefly earned the title of the 10th planet, yet it was precisely because astronomers expected to find further objects of similar mass and size that they decided new rules needed to be established before the number of official planets got out of hand. Eris actually resides in a region called the scattered disc. This region covers much the same space as the Kuiper belt, yet scattered disc objects are characterised by their less stable orbits. The distinction is not, however, clear cut and many astronomers include the scattered disc as part of the further reaches of the Kuiper belt. The orbit of Eris is typical of scattered disc objects in that it is highly elliptical. During an orbital period of 557 years, its distance from the sun varies between a maximum (aphelion) of 97.5 AU, to as low as 37.9 AU (perihelion). 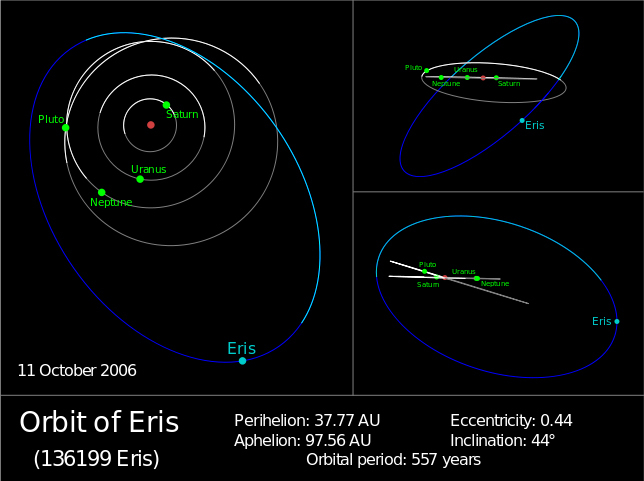 In 2011, Eris was close to its aphelion at 96.6 AU, and will not return to its perihelion until around AD 2256. This eccentric orbit naturally affects the planet’s temperature significantly, though its distance from the sun is so great at the best of times that its range of temperature is estimated at somewhere between 30 and 56 Kelvin – ie. -243 to -217 degrees. Not very hospitable. Infrared light from Eris indicates the presence of methane ice on the surface, suggesting it is similar in some ways to Pluto. 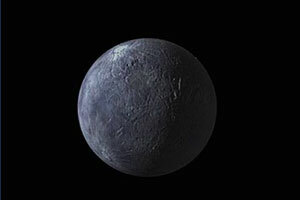 Eris appears to be grey in colour, though, like Pluto, it is far too distant to determine any surface features at this range, with our current technology. The artists’ impressions, detailed as they may appear, are merely approximations based on information gleaned from our knowledge of its mass, density, albedo (reflectivity) and the colour of light it emits. Our next stop on the New Solar System tour is Ceres – a dwarf planet whose presence has been known since 1801. 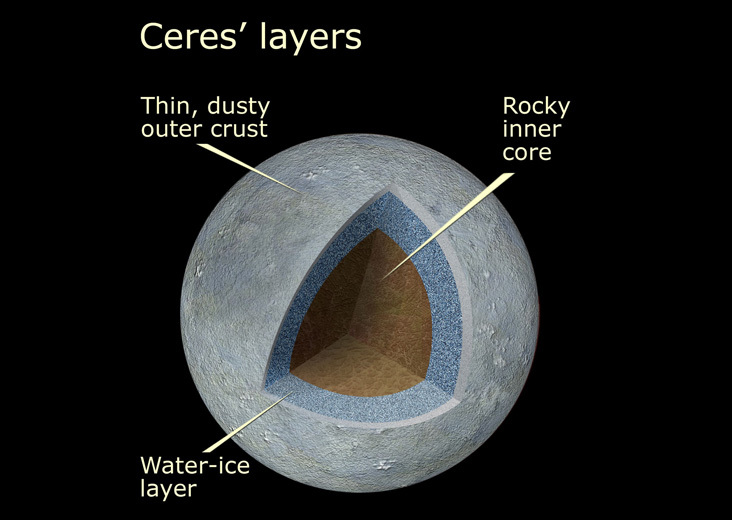 Despite its not being a new discovery, Ceres has only recently been re-categorised as a dwarf planet and is unique in being the only dwarf planet in the inner Solar System. Being the largest body in the asteroid belt, it was the first object to be identified in that region and was originally designated planetary status, along with the asteroids 2 Pallas, 3 Juno and 4 Vesta – a status it retained for roughly 50 years. The classification of Ceres is still somewhat unclear, with Nasa and various astronomy manuals continuing to refer to it as an asteroid, but then, the term asteroid has never been defined adequately and in many cases “minor planet” is used as a sort of umbrella rubric. So much for semantics. 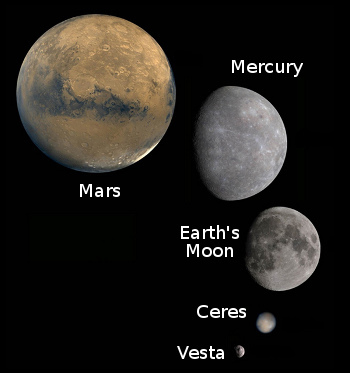 To all intents and purposes, however, Ceres is a dwarf planet. It certainly has a neat, round shape because its mass is sufficient to round it – rule 2 of dwarf planet status as outlined above. Ceres may be the largest object in the asteroid belt – around 950km in diameter – and consists of roughly one third of the belt’s total mass, yet it is still rather small, consisting of roughly 4% of the Moon’s mass. That sounds pretty puny, but then, this equates to a surface area of 2,850,000 sq km – roughly the size of India or Argentina, which is actually pretty large. 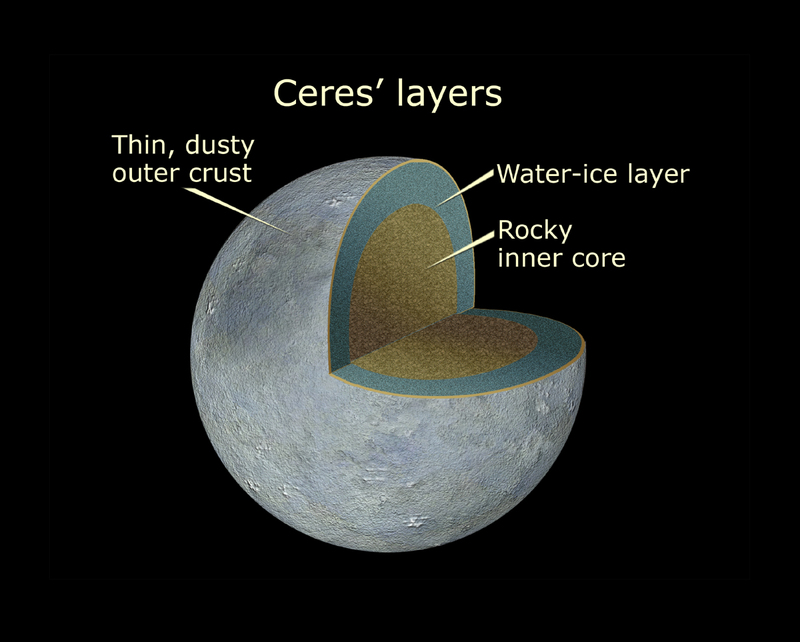 Ceres is especially exciting to us on account of its proximity, composition and its relative warmth. Orbiting between Mars and Jupiter, its maximum surface temperature has been measured at around -38 degrees Celsius, a little warmer than parts of Canada in winter : ) The surface of the planet is likely a mixture of water ice and carbonates and clay minerals and the planet may have a tenuous atmosphere, along with water frost on its surface. Because of its low mass and escape velocity, Ceres has been proposed as a possible destination for manned missions. Unlike Mars, where it would be extremely difficult to take off again, Ceres offers a much easier option for a crewed ship. Ceres has even been proposed as a possible destination for human colonisation – and also as a possible way-station for further exploration of the inner and outer solar system. 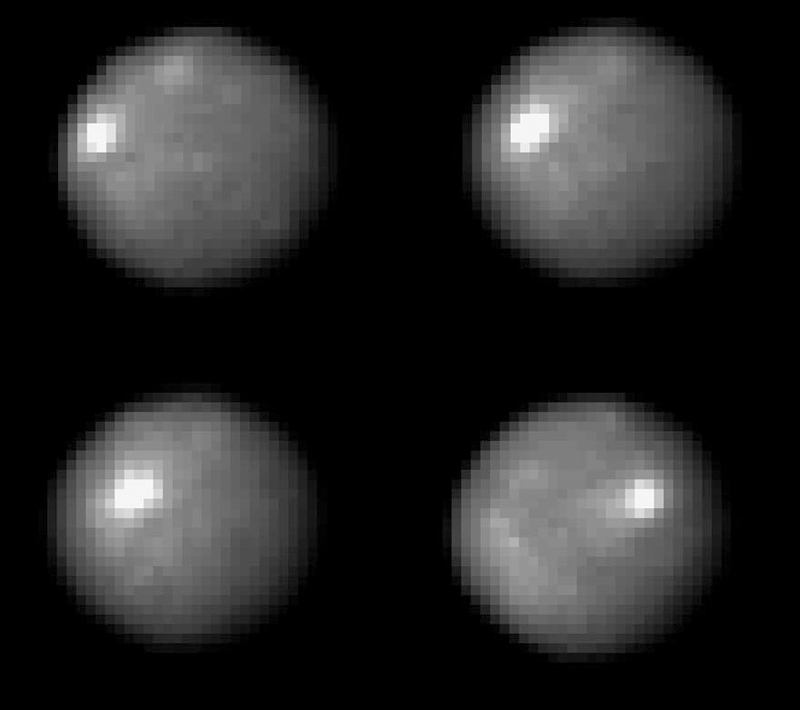 At this stage our knowledge of Ceres is fairly limited, but fortunately this is all about to change in March or April 2015 when NASA’s Dawn spacecraft arrives at Ceres. Dawn will initially orbit Ceres at an altitude of roughly 5,900 km and gradually reduce its orbit over a five month period to around 1300km. 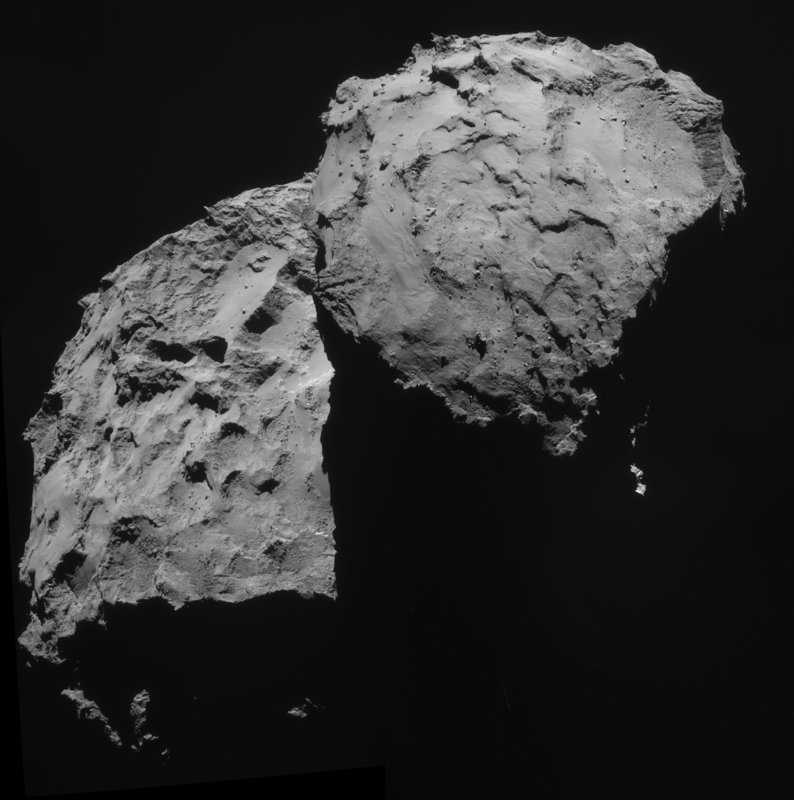 After another five months it will further reduce its orbit to a distance of only 700km. Equipped with cameras, spectrometers, gamma-ray and neutron detectors, Dawn is set to radically transform our understanding not only of Ceres itself, but of dwarf planets in general. 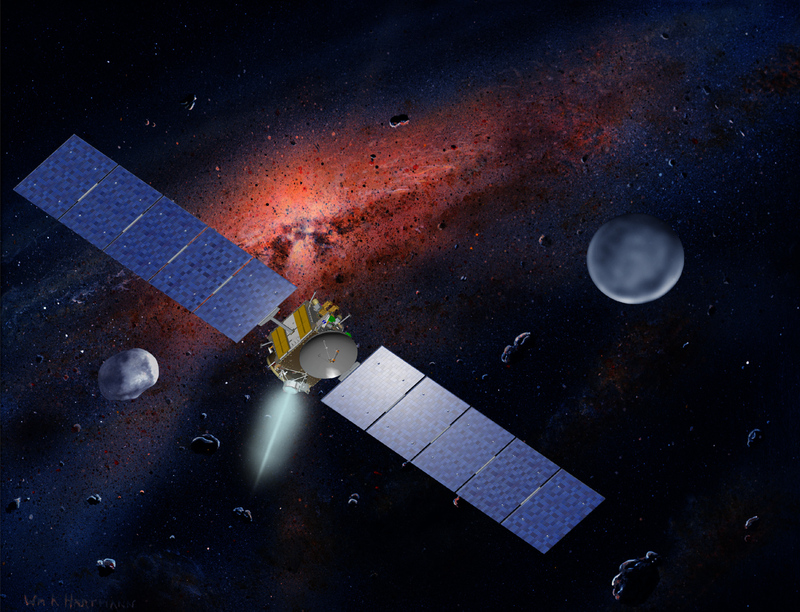 Launched in September 2007, Dawn has already spent more than a year in orbit around the asteroid 4-Vesta, which was, along with Ceres, initially recognised as a planet in the 19th century. It is one of the largest asteroids in the solar system with a mean diameter of 525 kilometres and comprises roughly 9% of the mass of the asteroid belt. At 800,000 square kilometres, its surface area is roughly the size of Pakistan. 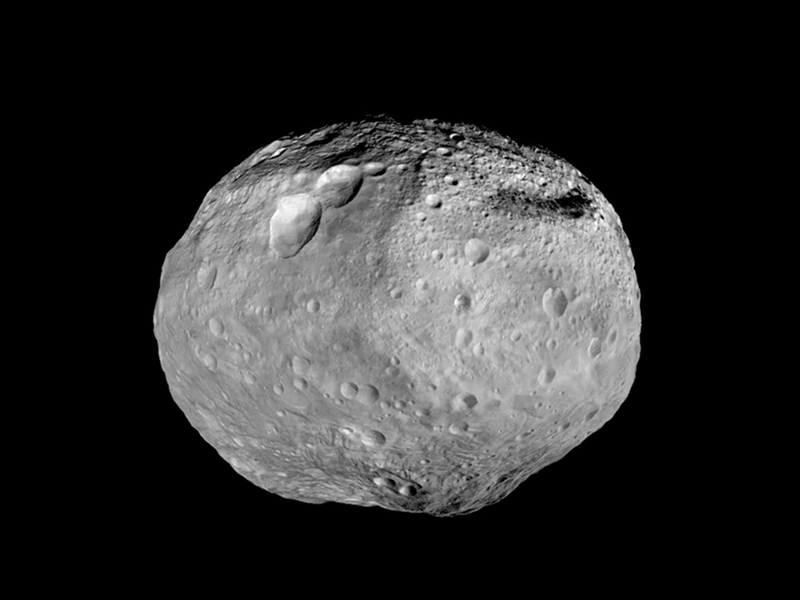 Sadly for Vesta, however, it didn’t quite make the dwarf planet grade and remains an asteroid, terminologically. Next on our list is Makemake, a dwarf planet named after the eponymous creator of humanity and god of fertility in the mythos of the Rapanui, the native people of Easter Island. It is roughly two thirds the size of Pluto and has no known moons, making it very difficult to correctly estimate its mass. 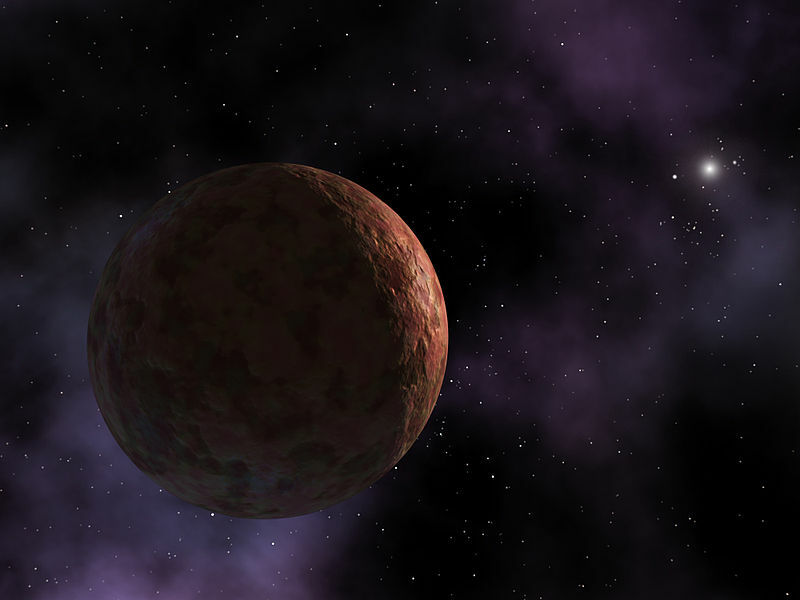 Makemake is considered another Kuiper belt object with an eccentric 310-year orbital period which varies in distance from roughly 38.5 AU to a maximum of 52.3 AU. 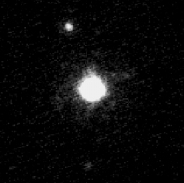 Makemake was another recent discovery – March 31, 2005 – and was officially recognised as a dwarf planet by the IAU in July 2008. 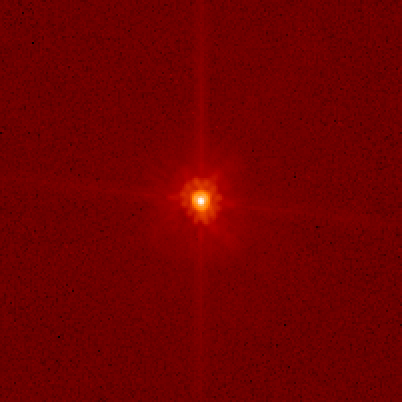 Makemake is too distant to obtain detailed information or images and our best observations come from April 2011 when it passed in front of an 18th magnitude star. 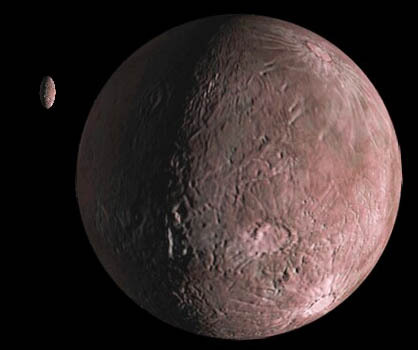 Makemake appears to lack a substantial atmosphere and its surface is likely covered with methane, ethane and possibly nitrogen ices. On account of its surface gases, Makemake might have a transient atmosphere much like Pluto when it nears its perihelion – ie, is closest to the sun. Like Pluto, Makemake also appears red in the visible light spectrum on account of the presence of tholins on its surface – molecules formed by irradiation of organic compounds such as ethane and methane, which have a reddish brown appearance. 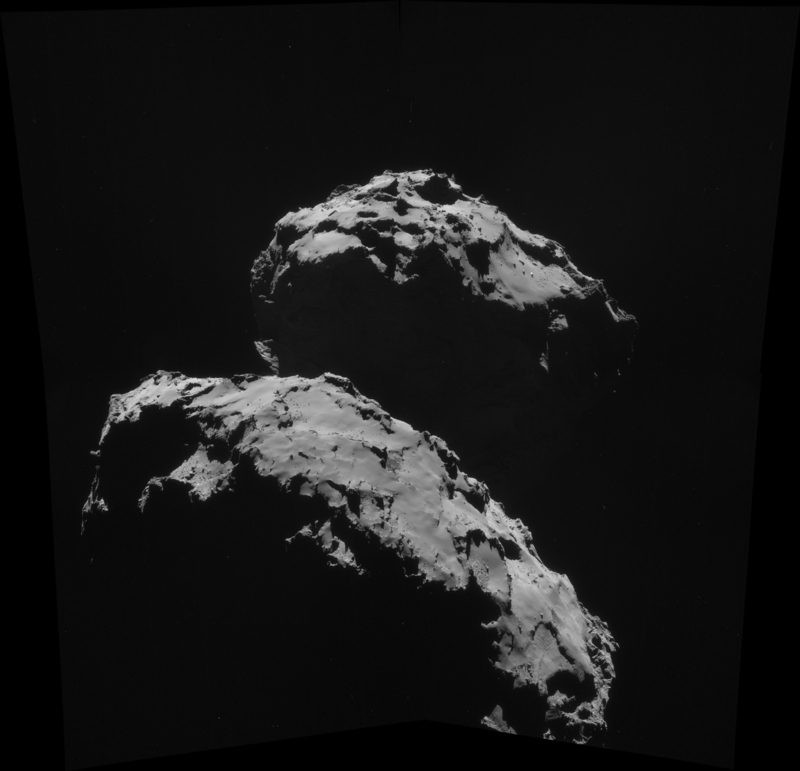 The colour and albedo of the surface varies in places, giving the planet a somewhat patchy, spotty appearance. Named after the Hawaiian goddess of childbirth, Haumea was discovered in 2004 and recognised as a dwarf planet on September 17, 2008. It has two moons by the name of Hi’iaka and Namaka. Haumea is distinguished not only by its shape, but by its unusually rapid rotation, high density and high albedo – caused by a surface of crystalline water ice. The surface colour and composition is considered peculiar – for its location the solar system, it should not have crystalline ice, but what is known as amorphous ice. This has led astronomers to assume that some relatively recent resurfacing has occurred, though no adequate mechanism has yet been proposed for this. A large dark red area on Haumea’s otherwise bright white surface was identified in September 2009, possibly the result of an impact. This suggests an area rich in minerals and organic (carbon-rich) compounds, or possibly a higher proportion of crystalline ice. 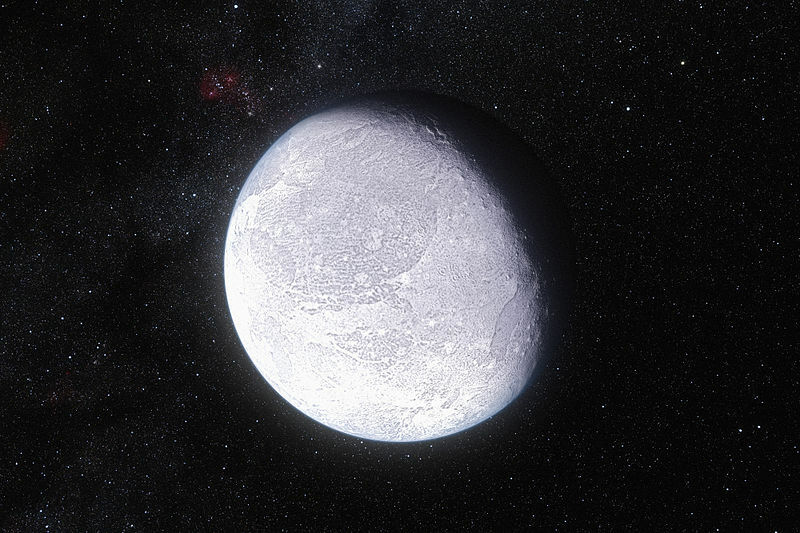 Consequently, Haumea may have a mottled surface similar to that of Pluto, if not as diversified. 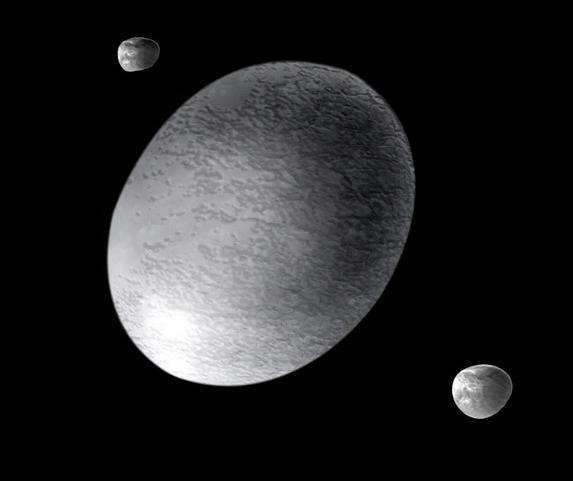 Haumea strikes me as an odd designation on account of its ellipsoid shape, as illustrated here. 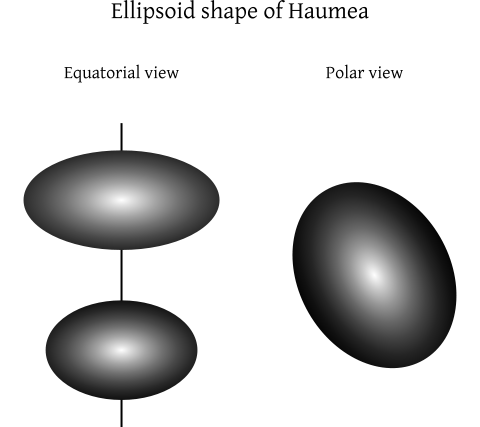 Haumea’s shape has not been directly observed, yet it is inferred from its light curve, which suggests that its major axis is double the length of its minor. 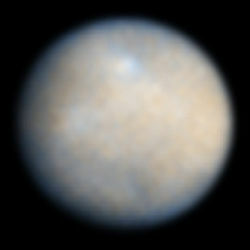 This may seem to challenge the definition of what constitutes a dwarf planet, yet it is considered to be in hydrostatic equilibrium – which, just to remind you, means : the object is symmetrically rounded into a spheroid or ellipsoid shape, where any irregular surface features are due to a relatively thin solid crust. Confusing, I know, but such is the nature of planetary classification. 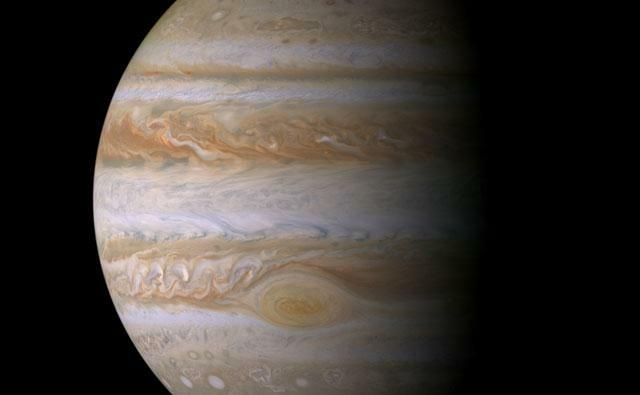 The shape and spin of the planet are thought to be the result of a giant collision. 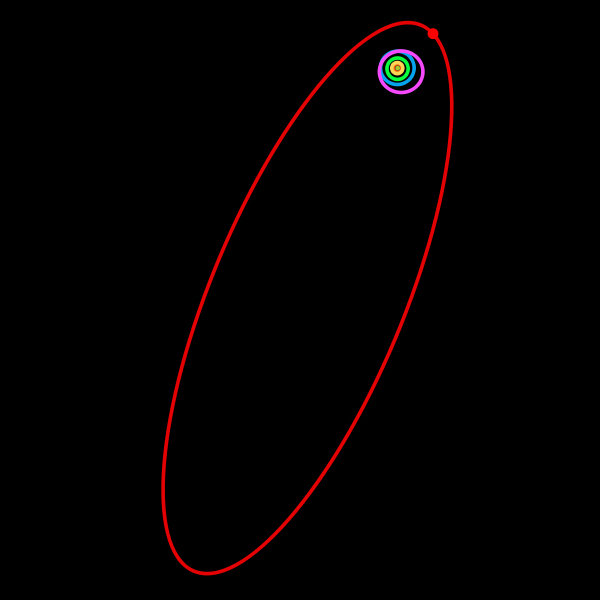 Haumea’s orbit is not dissimilar to that of Makemake, following a similarly elliptical path ranging from 34.7 AU to 51.5 AU. Like so many of the dwarf planets, it is a frozen and forbidding place, though at least the presence of water ice offers some refreshment. And last, but not least, let’s take a look at good old Pluto, a dwarf planet almost as mysterious as the others. Pluto is the second most massive dwarf planet after Eris and the tenth most massive body orbiting the sun. 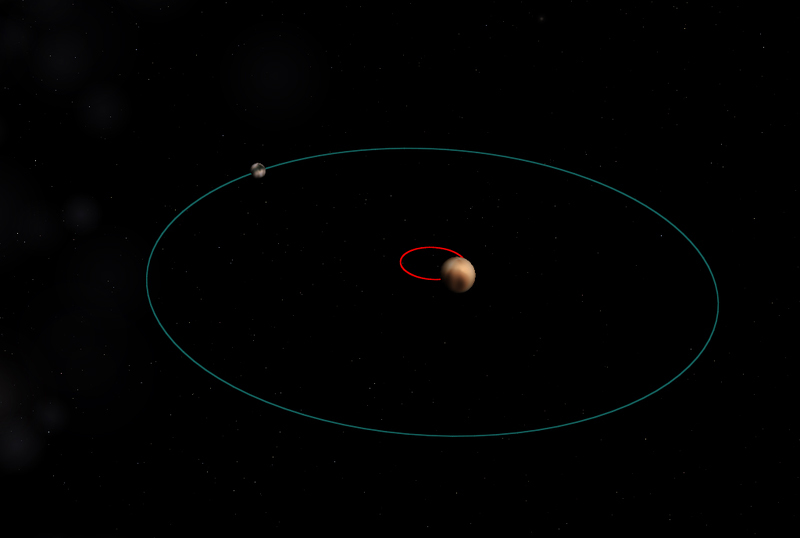 Composed primarily of rock and ice, it too has an eccentric and highly inclined orbit which, like many of the other TNOs, takes it from roughly 30 to 49 AU during its 248 year orbit. Pluto is exceptional among the other outer Solar System dwarf planets in that its orbit periodically brings it closer to the sun than Neptune. As of this year, 2014, Pluto sits at a distance of roughly 32.6 AU. We have already discussed Pluto’s demise as a planet, yet the questions surrounding its status began as early as 1977 with the discovery of a minor planet designated 2060 Chiron, an early candidate for the much coveted title of 10th planet. Chiron was the first of numerous icy objects to be found in the region of Pluto, suggesting that Pluto might merely be one of a cluster of minor planets in the outer Solar System. The ultimate result of course, after the discovery of Eris, was Pluto’s demotion, yet still many astronomers argue that it should remain a planet and the other dwarf planets be added to the planet count. 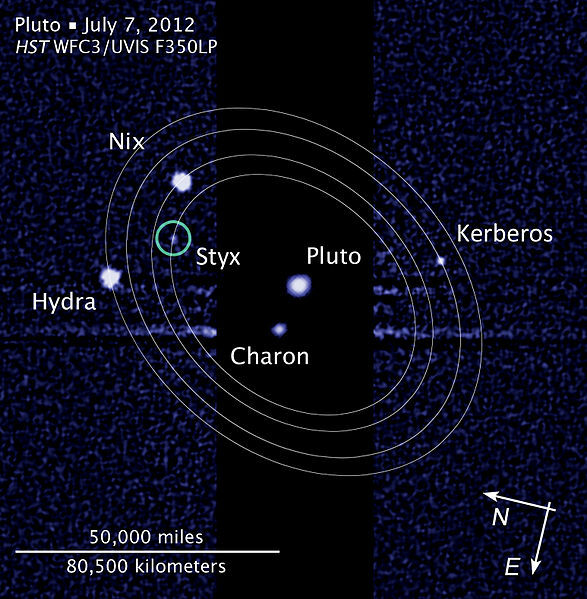 Pluto, however, has a further major peculiarity – it has five moons by the names of Charon, Nix, Hydra, Kerberos and Styx – and rather than these neatly orbiting around Pluto, it exists in a kind of binary dance with its largest moon. The barycenter of their orbits does not lie at Pluto’s centre, but between Pluto and Charon, rather like two dancers holding hands and swinging each other round, though Pluto remains very much at the centre of the dance. The IAU has yet to distinguish between such binary dwarf planet systems and others, and for the moment, there is simply no distinction. 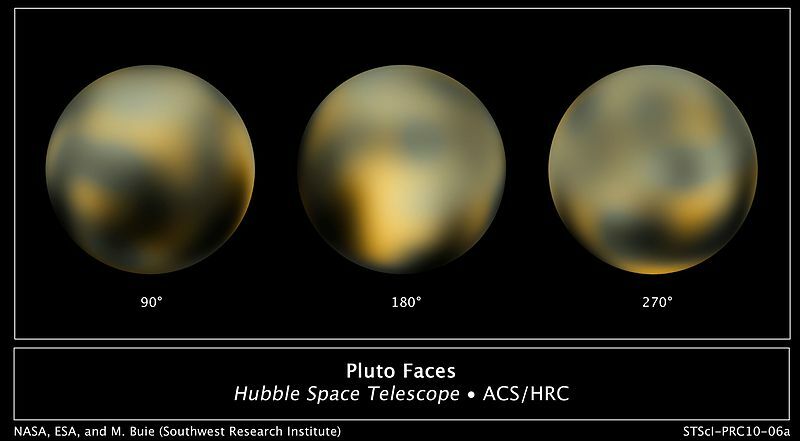 Our observations of Pluto have been very limited and only very unclear images exist of its surface. 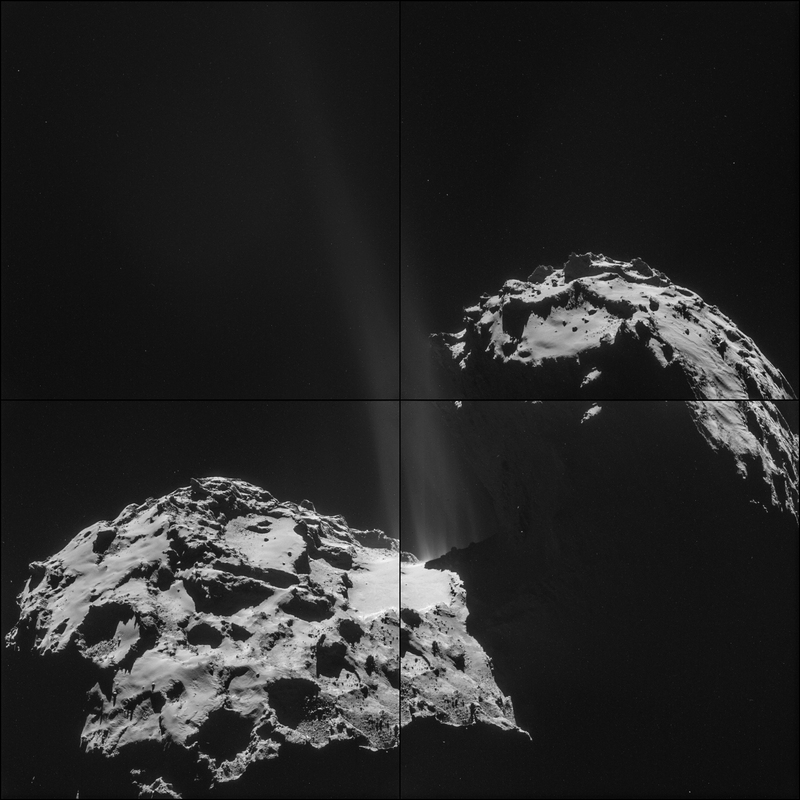 This, however, is about to change dramatically when, in 2015 (a great year for planetary exploration, woot!) NASA’s New Horizon probe will finally arrive at Pluto and perform a flyby. 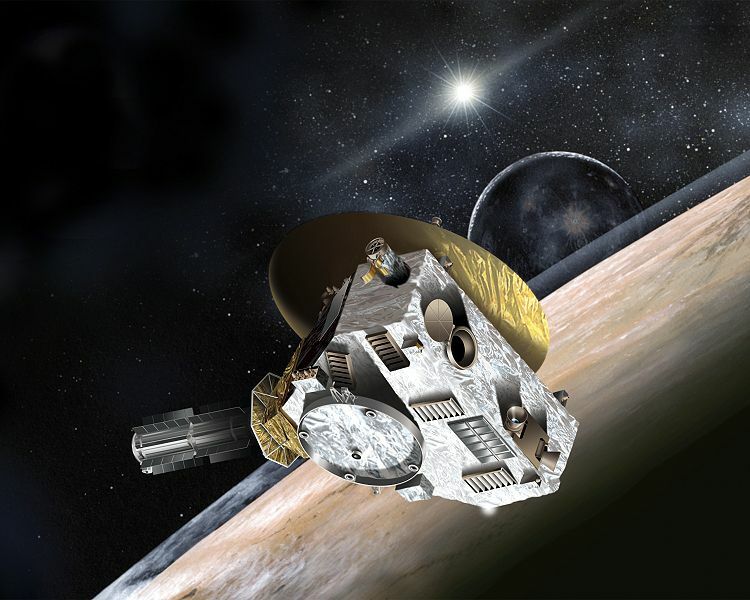 New Horizons will attempt to take detailed measurements and images of Pluto and its moons. When it has passed Pluto, New Horizons will attempt to explore the Kuiper belt, and astronomers have spent the last few years trying to find suitable targets within its flight path. Stay tuned. 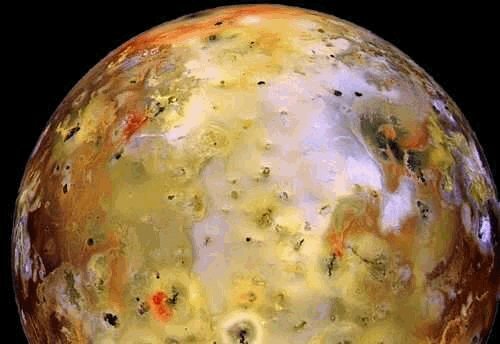 What we do know about Pluto is that it has one of the most contrastive appearances of any body in the Solar System, with distinct polar regions and areas of charcoal black, dark orange and bright white. It has a thin atmosphere of nitrogen, methane, and carbon monoxide gases, which are derived from the sublimation of the ices on its surface. Like some of the dwarf planets already discussed, Pluto’s elliptical orbit has an effect on its atmosphere and surface pressure. Indeed, as it moves further away from the sun, its atmosphere is likely to freeze and collapse. Like so many of the dwarf planets, which are extremely difficult to study directly, the size and mass of Pluto is based on best estimates. 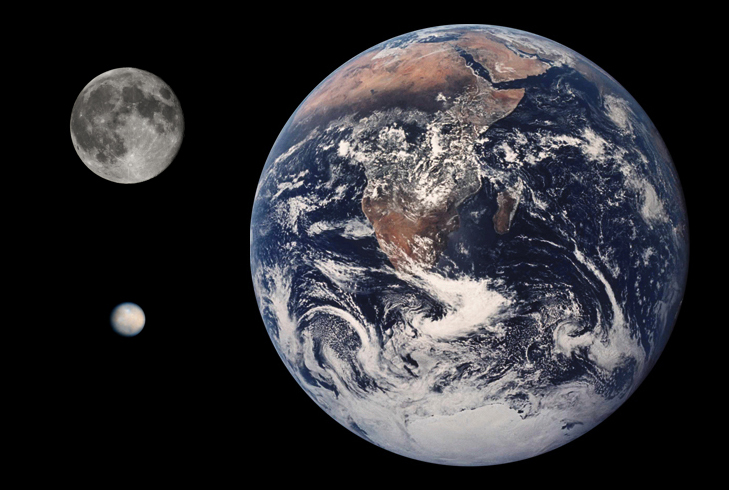 It is tiny compared even to the Earth, with a diameter of roughly 2306 km – around two thirds that of the Moon. It’s surface area is 16,647,940 km2 only 3.3% the size of Earth, and yet, when you consider that is roughly the size of Russia, it doesn’t seem all that small after all. Its mass, however, is significantly smaller proportionally at an estimated 0.24 % that of the Earth and, volume wise, around 18 Plutos could be squeezed inside the Earth. 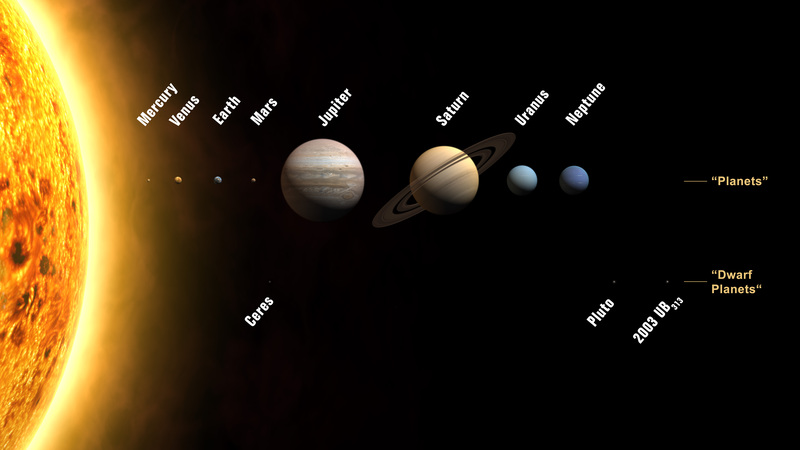 As mentioned above, Pluto is actually less massive than seven of the moons throughout the Solar System. – and finally, perhaps the oddest of them all – bright red Sedna, whose extraordinary orbit ranges from c. 76 AU to 937 AU and takes roughly 11,400 years to make a single circuit. It is the largest of these last three, though still just over two-thirds the size of Pluto. Despite their almost certain classification as dwarf planets in the future, no doubt along with many others, until such a time I shall refrain from taking the liberty. As to their future exploration, I certainly hope I shall live to see more light shed on them. Considering the time and cost of preparing missions, the distance of the outer planets and the lengthy travel times, it might be decades if not centuries before these planets are better revealed or even visited. Fingers crossed it will happen sooner rather than later, if only to satisfy my vain curiosity. India is full of dogs. Full of gorgeous, terrifying, menacing, cute, mad, hungry, desperate, rabid, emaciated, sleek, playful and murderous dogs. They are everywhere, in the way that Rome is full of cats, and then some. This huge population is largely made up of so-called Indian Pariah dogs, a breed which is estimated to have existed for roughly 14,000 years, and mixed-breed mongrels descended from pure-bred dogs that have mated with the pariahs. 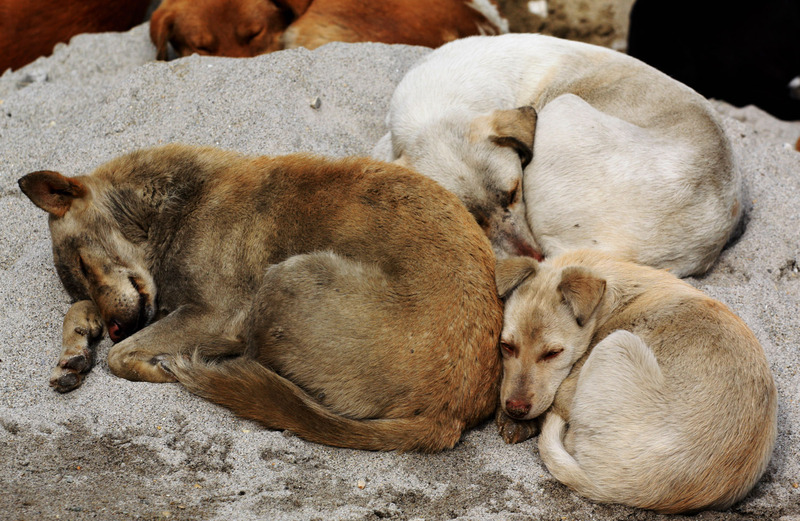 The abundance of exposed garbage and the tendency to keep dogs as free-roaming pets has created conditions very favourable to sustaining a large dog population. 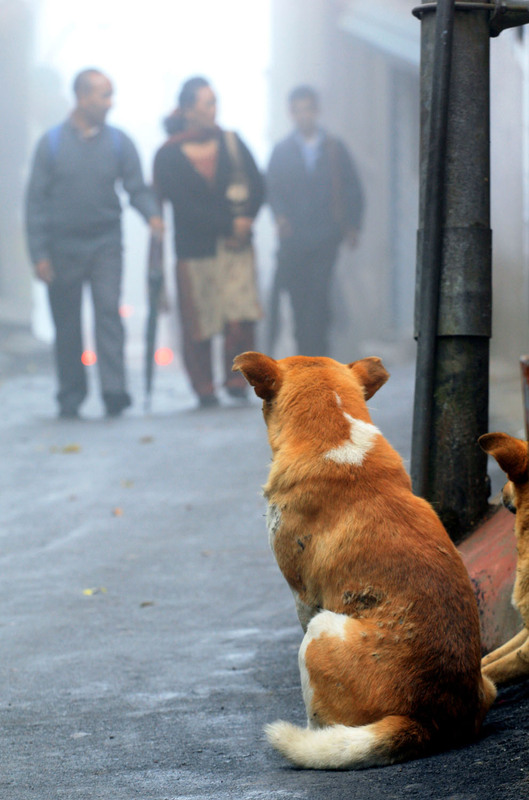 As India’s urban population continues to grow, so does the urban dog population. That’s not only a potential hazard, but a lot of extra mouths to feed. 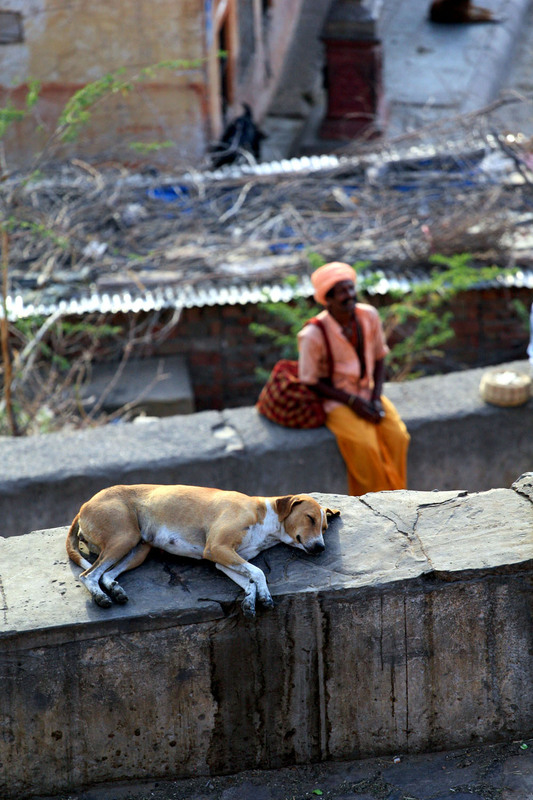 Dogs in India are considered a growing menace. 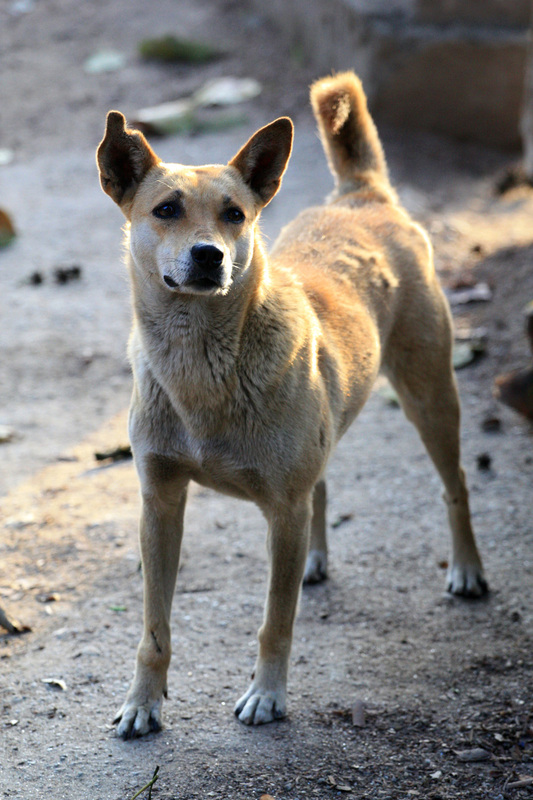 Take this for a statistic – India has the highest number of rabies deaths per year – estimated at between 20,000 and 35,000 – and 99% of those cases of rabies come from dog bites. Indeed, the number of dog attacks each year is staggering. 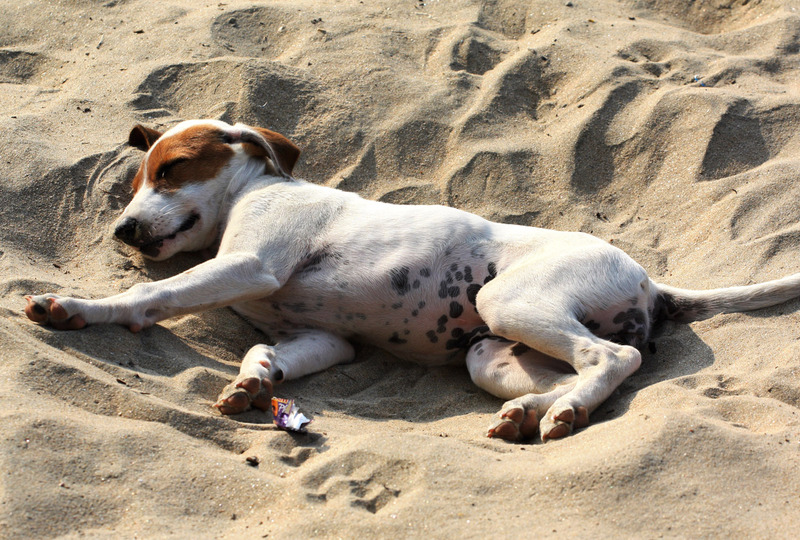 In 2011, in Mumbai alone, an estimated 80,000 dog bites were reported. The actual number of unreported bites is open to speculation, but the real figure could be considerably higher. In one attack alone in Nizamabad this year “a stray dog suddenly went berserk and started attacking people.” No less than twenty people were injured and had to be treated for bites. In truth, it’s a tragedy for everyone involved, dog included. It’s worth pointing out that my purpose here is not to malign dogs, or India in anyway, but rather to highlight something that has come to fascinate me during the three and a half months I’ve spent in India on two different trips in recent years. I’ve always been a real lover of dogs, having grown up with them, and was, at times, just as moved by the living conditions of the dogs as the people in India. They too are just doing their bit to get by, as they have done for millennia. Some of the dogs seem to be very healthy and robust, whilst others are in dire states of sickness and physical deterioration. 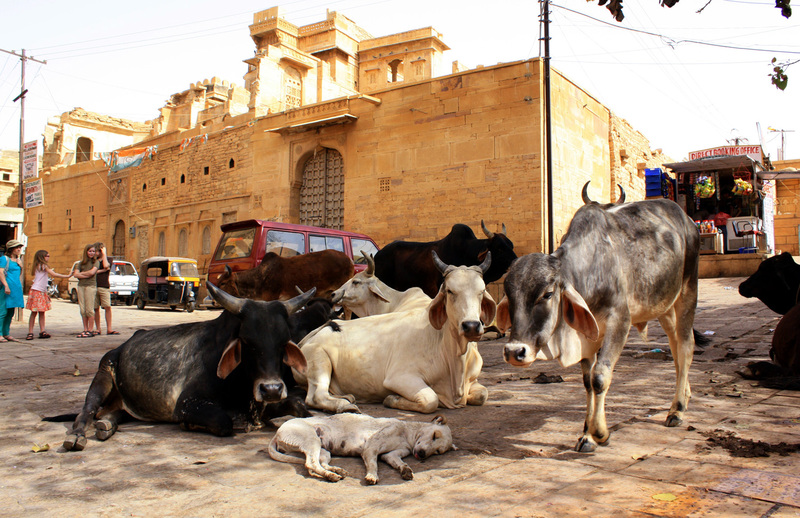 One thing I noticed – purely anecdotal evidence though it is – was that the least healthy dogs were in towns that were strictly vegetarian, such as Varanasi. Dogs are omnivores and certainly eat their fair share of vegetables, yet I wondered if there might be a connection here – the lack of any meat to supplement their diet caused them to suffer physically. The dogs I saw in Darjeeling, on the other hand, a town where a lot of meat is sold and consumed, seemed in very good health. Indeed Darjeeling had the largest concentrated population of dogs of any of the places I visited, something I noted in particular during my last visit there, in January of this year. During the day they tend to lounge around in the sunshine, where possible, curled up into tight, lazy bundles. They are mostly docile and friendly during the daylight hours, and very pattable. When given the chance they are sweet and affectionate, and it was difficult to resist approaching these dogs and stroking their ears. Darjeeling is a town which shuts down very early, and is quite dark at night, with relatively low-levels of street lighting. Once the night sets in, the dogs set off to scavenge and hunt, roaming the streets either as individuals or in packs. Much of the time they simply plunder the ample garbage piles for scraps and leftovers, but they have also been known to attack people and certainly fight amongst themselves. From our lovely room up the top of the Dekeling Hotel in the centre of town, we were kept awake until late each night by the constant barking and yelping of dogs down in the square below. It is little wonder that they sleep all day, having exerted themselves so much in their nocturnal prowling. Despite the apparent daytime harmony between the people and dogs of Darjeeling, this is, in effect, a story of competition and conflict between two integrated populations for space and resources, and this story is repeated right across India. 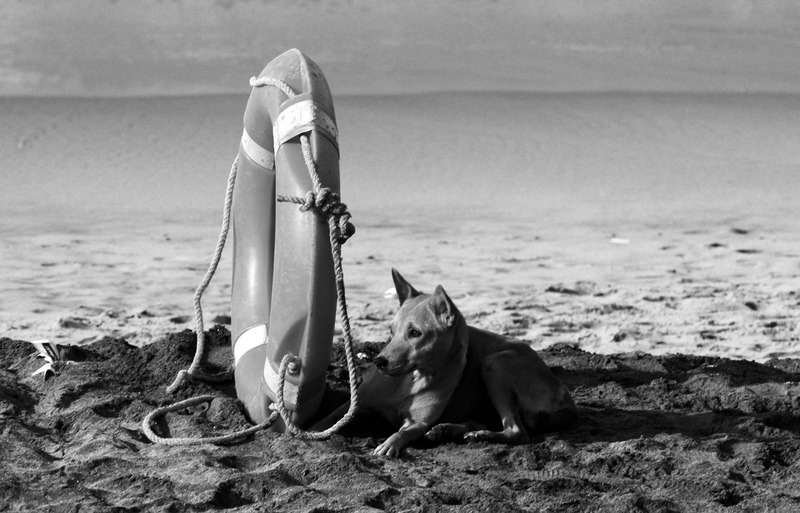 In practical terms, the dogs constitute a minority group, scattered throughout Indian society. Loved and hated in equal measure, they are hounded and harassed, as well as being treated with deference and kindness. 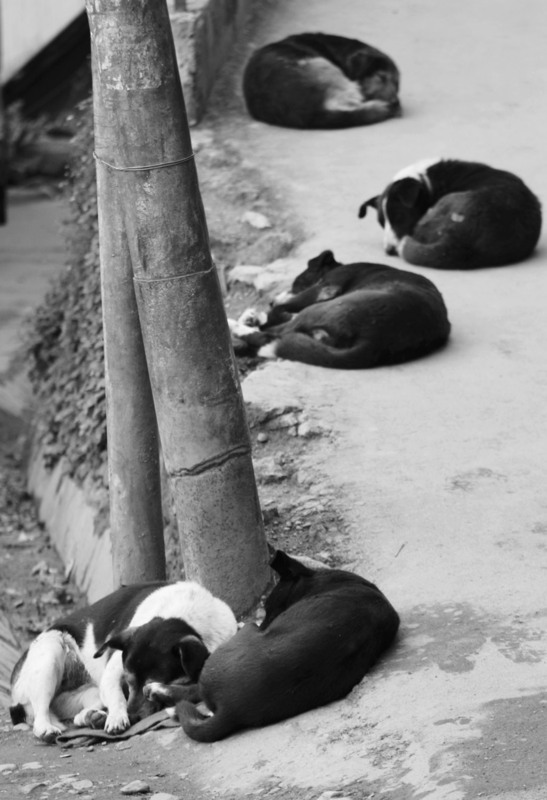 There are, of course, organisations working to stem the spread of street dogs in India such as the Vishaka Society for the Prevention of Cruelty to Animals (VSPCA), which vaccinates stray dogs against rabies as well as neutering them. There are ways to contribute to this charity from abroad, either directly or through third parties, such as The Animal Rescue Site. 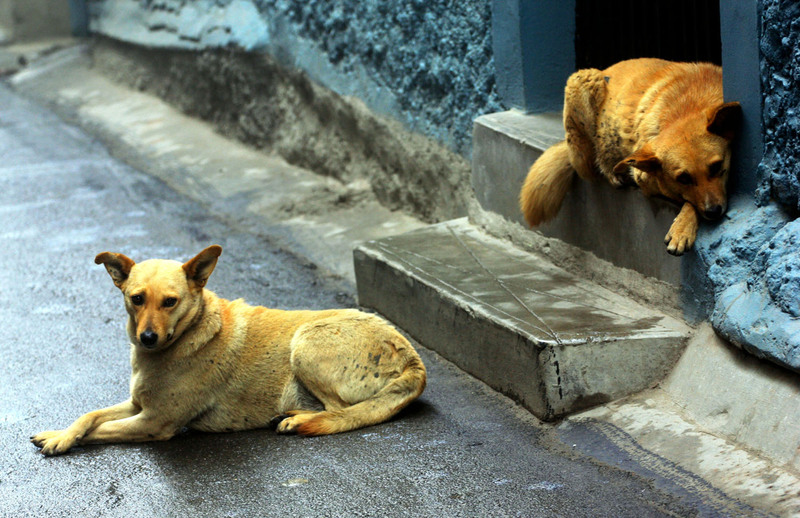 Their website paints a dramatic picture: With each litter born on the streets, canine overpopulation worsens, leading to malnutrition, untreated injuries, and the spread of disease, especially rabies. 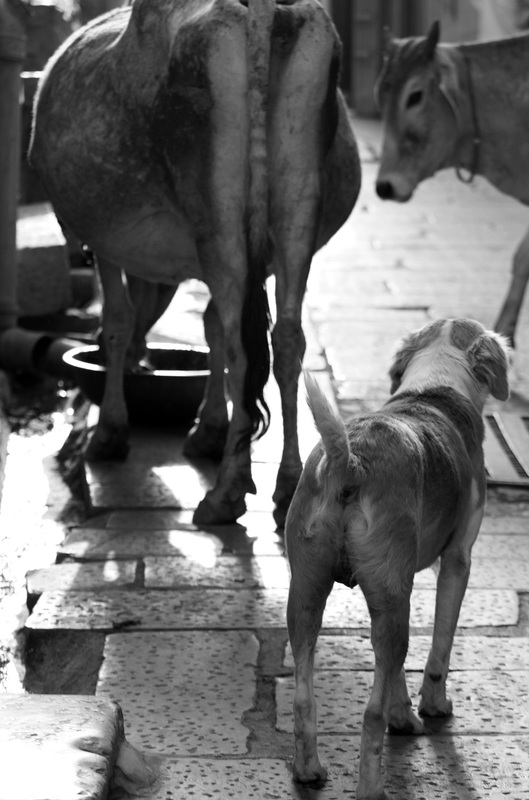 They also offer an important reminder of India’s ancient laws and traditions of respect for and protection of animals – Ahimsa – and it is worthwhile remembering that whilst many see the dogs as a menace and treat them cruelly, there is a great deal of acceptance and love for dogs in India as well. Indeed, the laws prevent them from being euthanized, acknowledging that dogs too have a right to exist. In the meantime, however, the problem seems to be worsening with the dog population growing and more and more people being bitten. 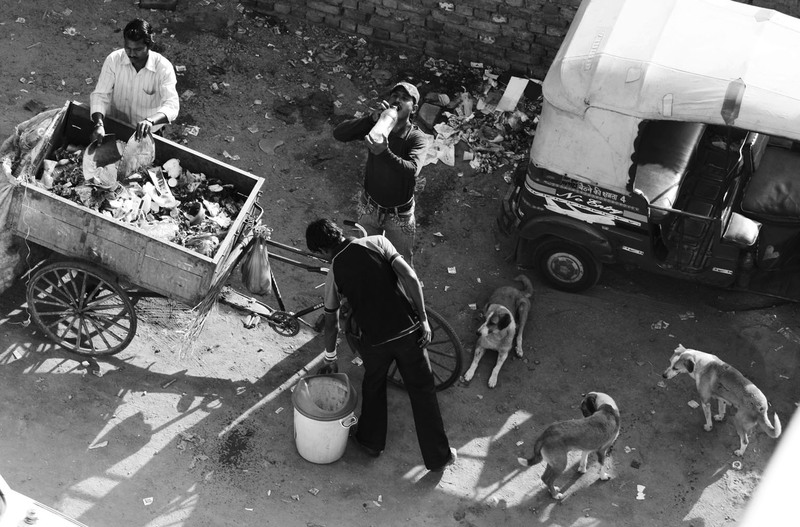 Without denying dogs access to the litter that feeds them, or having a more comprehensive program of neutering and vaccination, Indians will have to continue living alongside them, for better or for worse. As a dog-lover it is easy to feel sorry for these poor mutts. There is even a Facebook page called I Love Indian Stray Dogs, and I guess I love them too. This, however, is from the relatively comfortable and naïve position of not having been attacked or threatened by them. Either way, I hope a solution can be found that works for both humans and dogs. Ever since humans first allowed dogs into their lives thousands of years ago, we have been co-existing and co-evolving towards a kind of mutual dependency. When dependency changes into competition, it is a sorry situation for both parties. After the high times of the Cold War, the space race has gradually slowed to a crawl. The vast cuts to NASA’s budget – from an extraordinary peak at 4.41% of the Federal budget in 1965 to an estimated 0.48% in 2012 – and the cancelling of the shuttle program before the completion of a replacement reusable launch vehicle, have left them dependent on Russian rockets or the nascent private space industry to ferry personnel to the International Space Station. 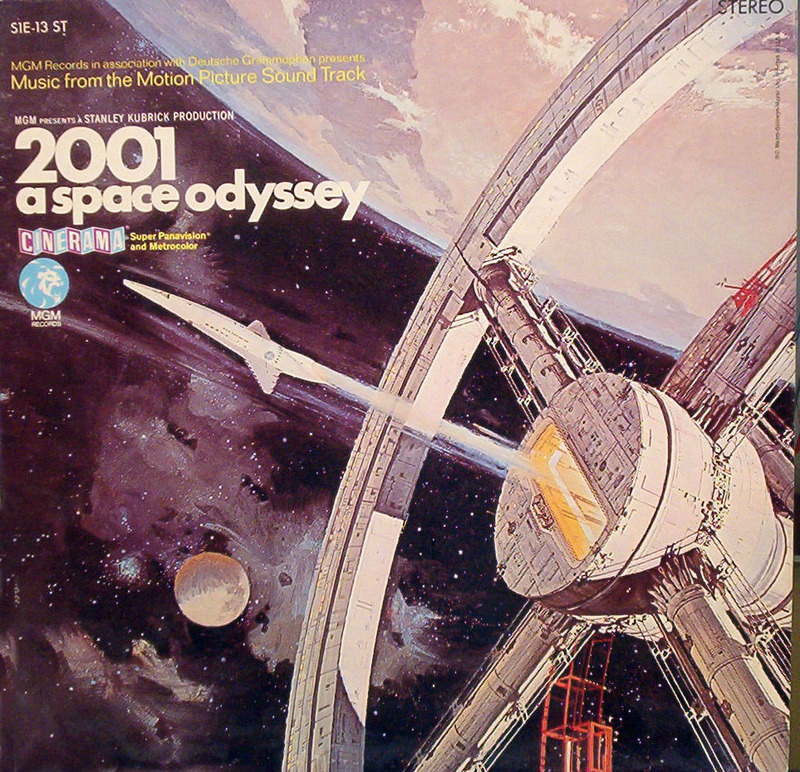 While China and India might be making bold strides with their own space programs, those grandiose, twentieth-century visions of the future, outlined in such classics as 2001: A Space Odyssey, seem quaintly naïve in retrospect. Without the budgets or political will of the initial Space Race, human exploration, or indeed, colonisation of the solar system remains a far-fetched and distant possibility. 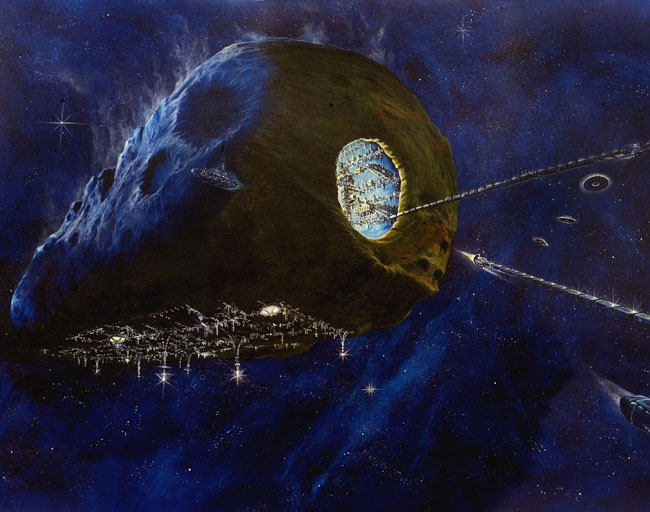 Science fiction has long provided examples of human exploration and colonisation of other planets and moons and, indeed, other planetary systems and galaxies. This idea has been around since before the origins of space-flight. More often than not, the time frame for these ventures has seemed utterly implausible. Consider the glittering visions of the Atomic Age, with vast space-liners and freighters ploughing the atmosphere over towering futuristic skylines – a future expected to arrive as soon as the 1980s. 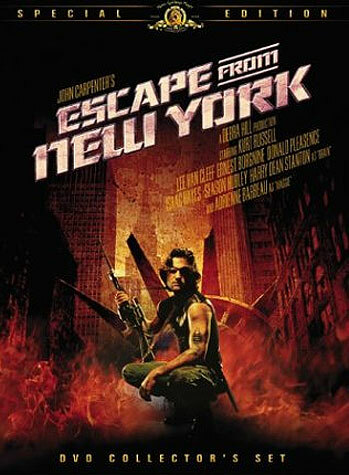 Even when our visions were darker and dystopian, apocalyptic futures were predicted – Orwell’s 1984, Harry Harrison’s More Room, More Room, or the film Escape from New York – the future was always too close. 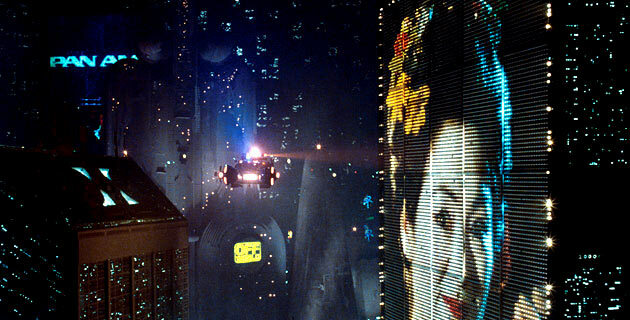 The 1983 film Bladerunner,which presented a world of flying cars and sophisticated androids, suggested that humans were leaving in droves for the off-world colonies. It was set in 2019, a date which will come and go without even a hint of an established human presence on another planet. More recently, the 2010 film Avatar posited a mining operation on the habitable moon Pandora in the year 2154. Even this still distant date seems preposterously optimistic. We might, by then, see humans active on other planets, moons, dwarf planets or asteroids in this solar system, but travelling beyond even the heliopause, let alone to bodies orbiting another star seems highly implausible. The journey times and our lack of a near light-speed propulsion system, nor craft designs that can withstand such stresses, is likely to ensure such ventures remain in the realms of science fiction. Currently the fastest speed achieved in space for a crewed vehicle is 39,896 km/h, and 252,792 km/h for an un-crewed vehicle. 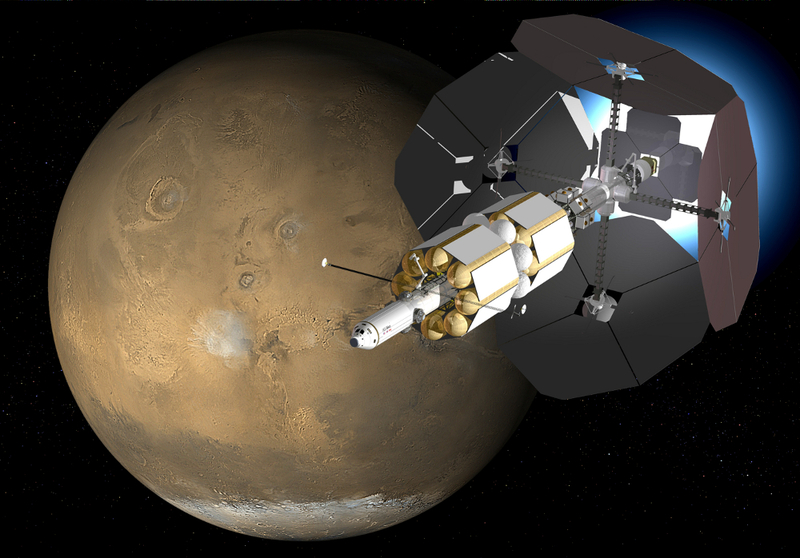 The VASIMR plasma propulsion system, which has been in development now for four decades, is touted to be capable of achieving speeds of up to 600,000 km/h, which would significantly reduce journey times – reaching Mars might be a matter of weeks instead of the standard six to ten months. Yet, considering that even the nearest star is 4.2 light-years away, the fastest possible journey time would be 4.2 years – and then only if we could achieve light speed – ie. 1,079,252,848.8 km/h. 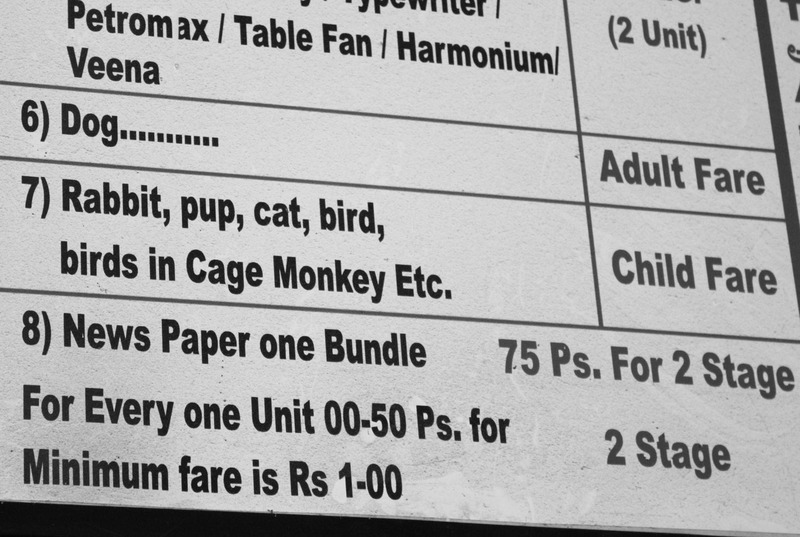 As much as I admire human ingenuity, this seems a nigh impossible prospect. Braking alone would be one hell of a job. Some will say it is short-sighted to dismiss the possibilities of the incredible technologies that will no doubt be available in the coming centuries. Yet until we overcome the very significant problems of cost, distance, radiation exposure, physical deterioration in zero or low gravity, delayed communication, psychological stress and a whole host of other issues, there seems little chance of humans prioritising efforts to leave our own solar system in the next couple of centuries. Looking closer to home, these very same problems are sufficient to make the colonisation and exploitation of our own solar system significantly difficult, if not unsustainably impossible in the long run. The first question that needs to be asked when considering the possibility of a human presence on other worlds is why go? There are, of course, many reasons why humans might choose to do so. The restrictions and limitations of Earth-based observatories, for example, have already led to the positioning of telescopes in space for better observations of the universe. Astronomers have long suggested that the moon would be an even better place to locate far larger and more sophisticated observational instruments, and this is certainly a viable long-term option. Whether or not such a facility would be crewed is another question altogether, though this would likely be an unnecessarily expensive extravagance. The sheer cost of simple space exploration is already too great a disincentive to justify sending people for scientific purposes alone. The long-proposed crewed trip to Mars is now off the books at NASA and most experts think at best a time-frame of thirty to forty years is plausible for such a venture. The 2.5 billion dollar budget of the Mars Science Laboratory, better known as the Curiosity rover, is, for now, the last grand project NASA has planned for the solar system. The money simply is not there any longer. A more economically viable reason for expanding human activity in space is tourism. Humans have already proven that they are willing to pay as much as twenty million dollars to go briefly into space on a Russian rocket, and already a ticket has been bought at a cost of 150 million dollars for a proposed circuit of the moon four years from now. The incredible sights of the solar system – the mountains and canyons of Mars, the ice fountains of Enceladus, the volcanoes of Io, the turbulent storms of Jupiter, the rings of Saturn, the ethane and methane lakes of Titan, the curious dance of the binary dwarf planets, Pluto and Charon, the towering ice cliffs of Dione to name a few, could one day make a very tempting grand tour for the mega, or perhaps, the meta rich. Yet even journeys to destinations in the inner solar system, Venus, Mercury and Mars, would still require very great improvements in our spaceship building and life-support capability. There is also the consideration of the long-term destiny of the human species. We know that in roughly five billion years our star, Sol, will swell to a vastly greater size and engulf the inner planets in its flatulent death, burning away what remains of the Earth’s atmosphere and oceans and ultimately, the planet itself. If we hope to continue to exist indefinitely, then irrespective of how unimaginably distant this date with planetary death might be, we have no choice but to find a new home. This, however, is hardly a priority at the moment. If human colonisation is ever to take place, it will likely happen on a very, very long and slow timescale. Consider even the easiest option – a colony on the moon. It would take years just to establish the first structures on the surface, which would no doubt have to be very utilitarian. The moon has a cycle of 14 days of sunlight and 14 days of night, making solar power an unlikely prospect for energy. It is lacking in water and important volatiles such as argon, helium and compounds of carbon, hydrogen and nitrogen, leaving humans at the mercy of Earth resources for life-support and construction purposes. Structures might be pre-fabbed in space and somehow landed on the surface, yet even this would challenge our current engineering capacity. Perhaps our best parallels are the scientific bases in Antarctica, though even building something as sophisticated as these would require incredible engineering and vast sums of money to get the materials and labour to the moon. And some bloody huge rockets. Having established even a tiny presence on the moon, we must then ask, how long before these colonies grew into anything beyond a scientific or industrial outpost? If there were to be any sort of recreational facilities, then this would require staffing and all manner of supplies that would need to be replenished on a regular basis. What would it cost to establish a cocktail bar on the moon, a hotel, a sauna and spa, a beauty salon? Who would go to work these jobs, and how would the facilities ensure safety, psychological stability, provide medical services and so on? Would there be much satisfaction in living in what would initially be a very small, claustrophobic community with limited recreational possibilities? There would no doubt be many customers wishing to get married on the moon, spend a honeymoon there, experience the incredible sight of the Earth-rise, yet one can see from this brief discussion that the business of providing the facilities and services would likely be expensive beyond all imaginings and take years to establish. It is by no means impossible that space-tourist dollars will be sufficient to drive such developments, and I wouldn’t rule out a permanent human presence on the moon by the end of this century. NASA, of course, is not the only player in the game and increasingly the space programs of other nations are making impressive leaps forward. In 2008, India sent a space-craft around the moon and plans to send a satellite to orbit Mars in the coming year. China has made its ambitions clear with its vigorous and successful efforts to put people, Taikonauts, into space. Their incredible and centralised industrial capacity might reach such heights in the next few decades that building interplanetary craft will become simply another production-line process. Yet such a program would require an incentive far greater than mere prestige. 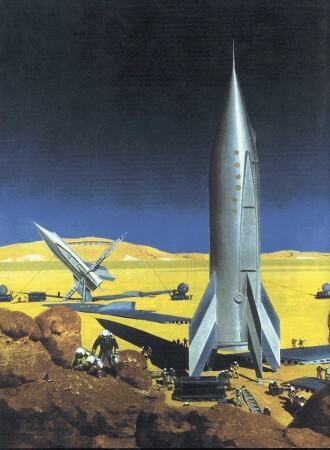 Japan, Russia, Iran and the European Space Agency also have sophisticated space programs and long-term ambitions for either scientific exploration, satellite deployment, industrial exploitation and, potentially, human colonisation, yet it is unlikely that any of these national programs will be building space bases on other planets, asteroids or moons any time soon. Unless they can justify the costs, and, indeed, find the capital in the first place, it seems the only types of enterprises that can sustain themselves in the long term are those that are capable of generating profit – and those profits will need to be as colossal as the venture itself. Despite the apparent caution of the above, I believe that humans are, at last, on the cusp of expanding their activity and presence in the solar system. On May 22nd this year, SpaceX, the private company founded by Elon Musk, the man behind PayPal and the Tesla Roadster, successfully launched its Falcon 9 heavy payload rocket carrying another SpaceX vehicle, the Dragon Capsule, to the International Space Station. It is difficult to downplay the significance of this achievement. Private operators have finally proven that they too can not only design and launch space vehicles, once the preserve of national governments, but they can build and design the entire craft themselves. NASA, on the other hand, has always relied on contractors to make some of its components. That private enterprise has the wherewithal to equal and potentially better even NASA’s achievements is evident. Exactly where that leads is another question. A quick search of private space companies on the web will throw up an ever-lengthening list of businesses: Orbital Sciences Corp, Scorpius Space Launch Company, Interorbital Systems, Armadillo Aerospace, Blast Off! Corp, MirCorp, Space Adventures, ARCA and Galaxy Express, are a few hastily chosen examples in no particular order. Some companies have less ambitious plans – focussing solely on the design of rovers or propulsion systems, but others have grander designs of providing entire space-craft capable of fulfilling a variety of different roles. 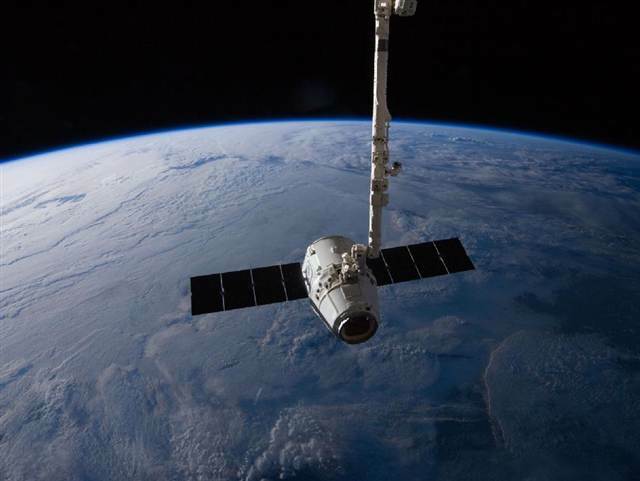 A company such as SpaceX, now firmly established as a contractor to NASA, has clear potential to develop and provide further bespoke craft for a variety of different purposes. It is likely just a question of time and money before we see more sophisticated vehicles being designed according to demand, be they in the service of tourism or heavy industry. As things stand, it is this first category, tourism, which is behind much of the new enthusiasm for private space ventures. Virgin Galactic is now firmly focussed on its program of providing short, sub-orbital space-flights in its Spaceship 2 vehicle, for roughly $200,000 a ticket. 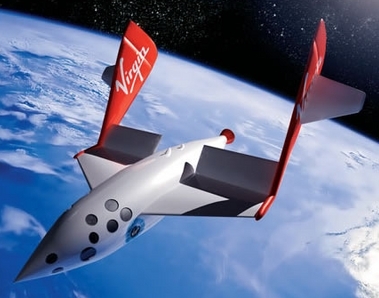 Should the venture prove to be as successful and profitable as is predicted, then no doubt Virgin Galactic will look to expand and upscale its operations. Other companies will almost certainly join this race into low Earth orbit to cater for wealthy joy-riders who wish to experience zero gravity and see the Earth from space- albeit, very briefly. Space tourism has, in fact, been with us for some time already. 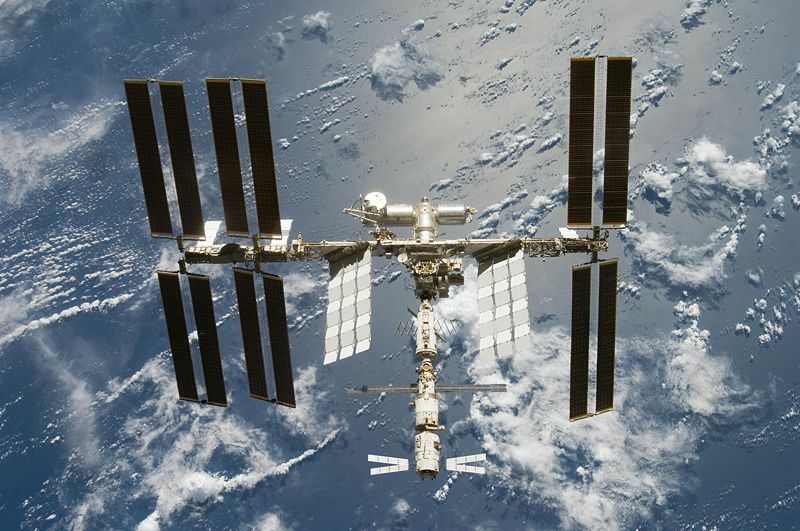 Between 2001 and 2009, Space Adventures offered flights to the International Space Station aboard a Russian Soyuz spacecraft for a price of between $20 and $35 million US dollars. 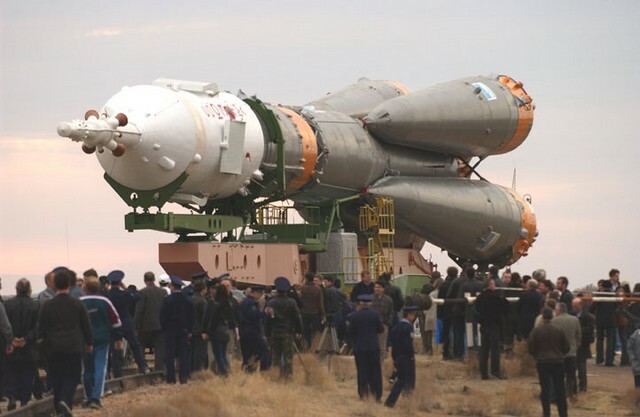 With the increase of the crew size on the ISS in 2010, the program was halted, but is expected to resume in 2013. As mentioned above, plans are afoot to offer two space tourists and a pilot the chance to do a 10-21 day moon flyby for roughly $100 million per passenger; the longer trip would include a visit to the ISS. Tourism certainly has the potential to drive the space industry forward in future years, yet whether or not this will lead to the development of tourist resorts and facilities is another question. Will we see a hotel built in Earth orbit sometime in the coming decades? Perhaps one might be placed in orbit around the moon, or indeed, on it. Yet again, the many difficulties of building, staffing, supplying, maintaining and funding such a venture safely will be prohibitive, though by no means impossible. One reason space ventures are so expensive is the cost of putting people there safely. The capacity to carry even a single person on a craft radically changes both the design and scale of the vehicle. 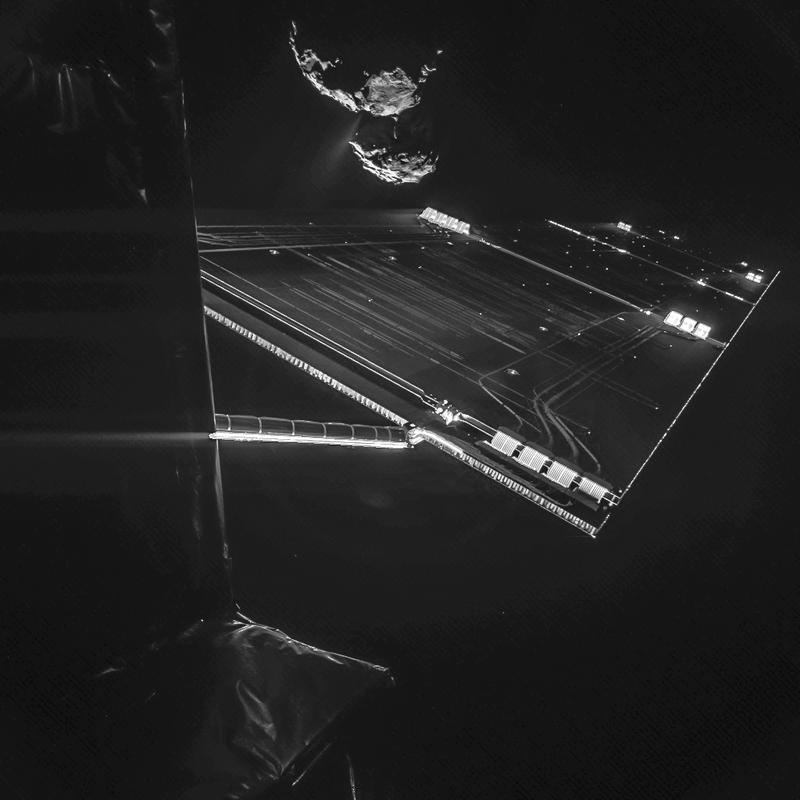 Robots and probes do not require food, oxygen, hydration, sleeping quarters and waste disposal for example, and nor do they need to come home when their mission is completed. One of the biggest obstacles to a crewed mission to Mars is designing a ship that can not only reach the planet safely with a human crew, but still have sufficient thrust to leave the surface once done there. Mars may only have one third the Earth’s gravity, but on account of its mass, it has roughly 45% of Earth’s escape velocity. 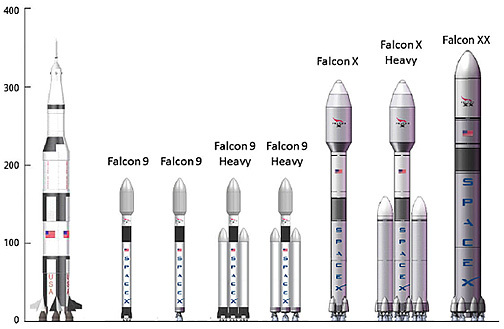 This means that to leave the surface of Mars, we need a rocket almost half the size of the rockets required to blast off from Earth, and the rocket that blasts off from Earth needs to carry such a rocket in the first place, meaning it would have to be a very, very large rocket indeed. The Curiosity rover, of course, only needs a one-way ticket. All of this is, however, academic. Until we come up with a real incentive beyond mere prestige for sending humans instead of machines into space, the costs are too difficult to justify. Tourism might just be that killer app, as it were, yet, as it stands, the only other truly affordable incentive for going is the profit-driven pursuit of resources. The idea of exploiting the vast mineral resources of the solar system is nothing new. 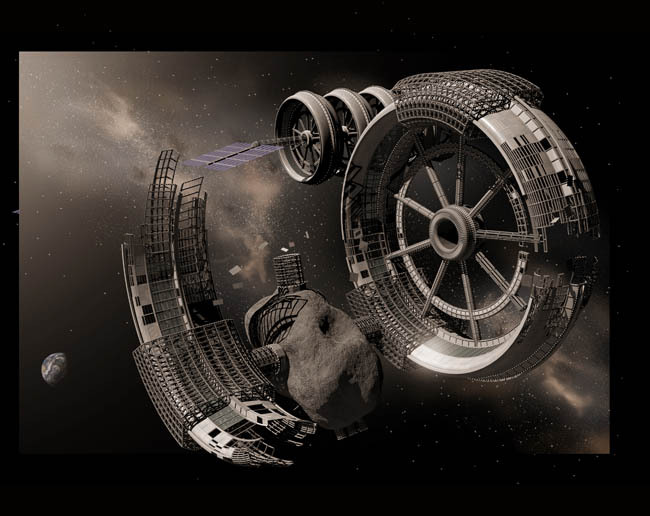 Science fiction has offered countless examples of mining operations on distant planets and asteroids. 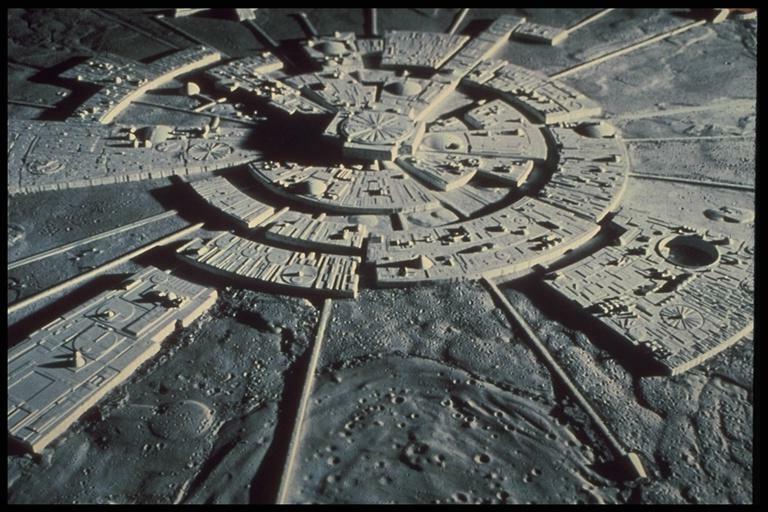 The 2009 movie Moon, for example, posited a largely automated strip-mining facility on the moon, staffed by a single clone, which collected Helium 3 from the surface and shipped it back to Earth, allegedly accounting for almost 70% of the planet’s energy needs. Helium 3 is very rare on Earth but is more common on the moon – embedded in the upper layer of regolith – and has long been proposed as an energy source for new generation nuclear power plants. Whilst the potential of Helium 3 is largely speculatory, the idea of mining the moon is less so; it also contains commercially valuable deposits of iron, titanium, silicon and aluminium, for example. Yet there are other, perhaps easier and more profitable targets. Consider these figures. In his book Mining the Sky, John S. Lewis suggests that an asteroid with a diameter of one kilometre, with a mass of around two billion tonnes, of which there are roughly one million within our system, would contain something in the realm of 30 million tonnes of nickel, 1.5 million tonnes of cobalt and 7500 tonnes of platinum. The value of the platinum alone would, at current market value, be more than $150 billion USD. A NASA report estimated that the mineral wealth of all the asteroids in the asteroid belt would exceed $100 billion for each person on the planet (based on a population of 6 billion). The asteroid 16 Psyche is estimated to 1.7×1019 kg of nickel–iron, which, at current rates of consumption, would meet the world’s demands for several million years. Such an abundance could, ultimately, sink any such ventures. If the market was suddenly flooded with platinum, for example, the value of the metal might be significantly reduced. 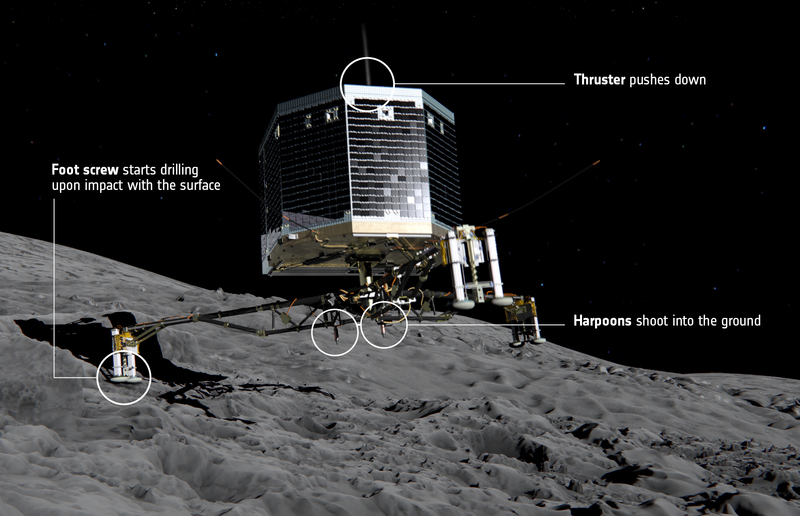 This would be just one of many significant economic risks involved in asteroid mining. There has been a lot of talk about reaching peak oil on Earth, but other elements essential to modern industry might one day be in short supply. Worst case scenarios suggest shortages of important resources such as zinc, silver, tin, lead, gold, indium, antimony and copper within 50-60 years. Through methods such as spectroscopy and the study of meteorites, asteroids are also known to contain other very valuable elements such as cobalt, manganese, molybdenum, osmium, palladium, rhenium, rhodium, ruthenium and tungsten. Considering that all these elements originally arrived on Earth from asteroids and comets during the planet’s formation and the period known as the Late Heavy Bombardment, it seems appropriate that we should again look to asteroids for these important resources. Just how we will achieve such a feat, however, remains the pivotal question. To begin with, we would need to build and design equipment capable of mining an asteroid and shipping the material back to Earth. Then we would need to get it to the asteroid. 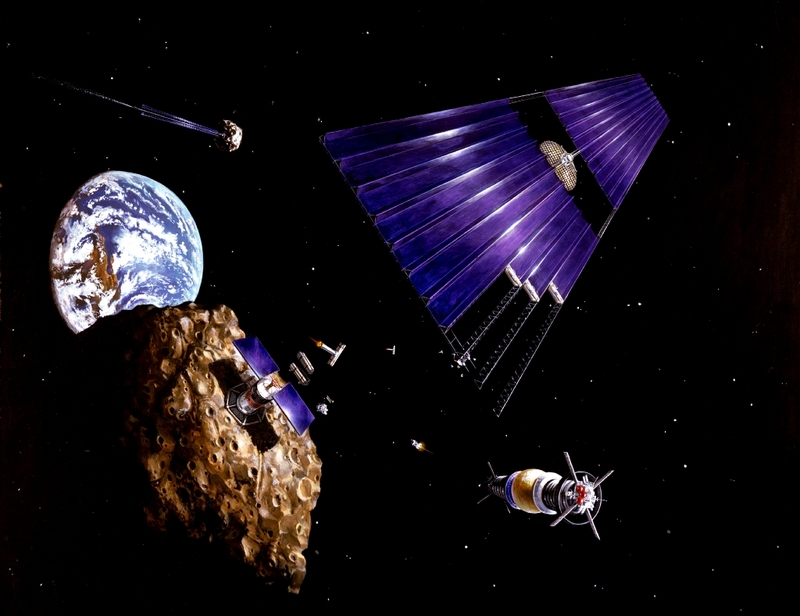 The actual method of mining might vary according to the asteroid’s composition; they might be strip-mined, shaft-mined or perhaps material could be collected magnetically from the surface. Due to their relatively low mass, asteroids have almost zero gravity, meaning that any equipment would need to be somehow tethered to the surface. Depending on the mining methods used, debris would likely float off into space, for better or for worse. The process of mining would need to be almost entirely automated as a human presence would require a whole new level of commitment and industrial engineering. Yet, without a human presence, any mechanical failure would be extremely difficult to fix, even by remote and robotic means, on account of the distance and delay in communication. There is also the problem of collecting, refining, packaging and transporting the material back to Earth. How this would be done is anyone’s guess. Would we need an endless store of rockets to shoot the minerals back to Earth? Could they be somehow bundled and flung into Earth orbit, or to the moon for that matter, then collected and transported to the surface, perhaps by the long-dreamed of space-elevators? Would it be possible to transport asteroids into orbit around the Earth or moon where they might be more easily mined by both humans and machines? When we begin to ask all these questions, the problems seem almost insurmountable. Yet, the lure of such vast profits has already seen the formation of three companies with serious proposals to mine asteroids. 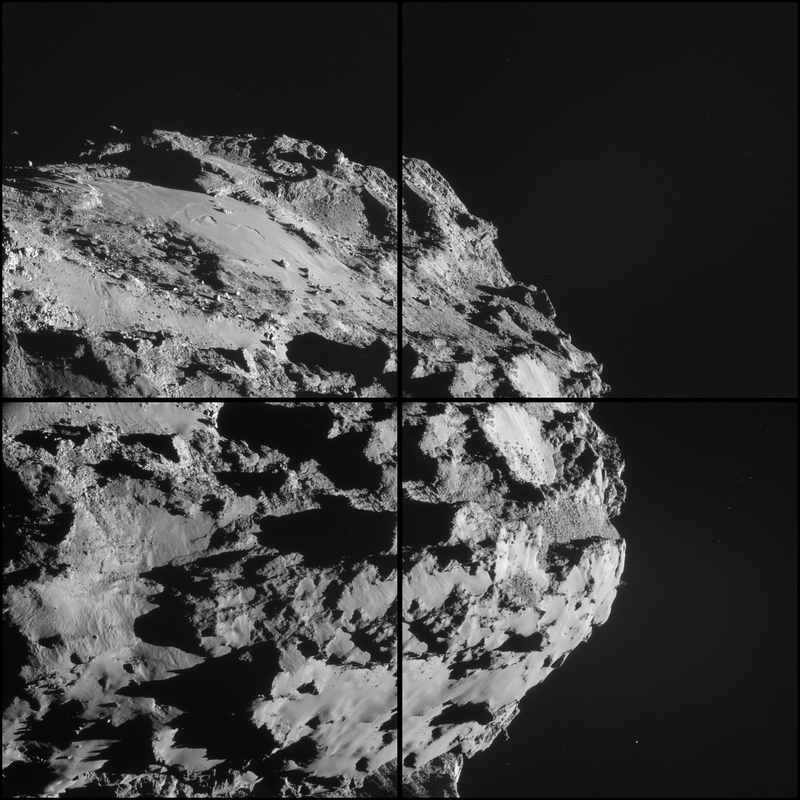 In November 2010, for example, the company Planetary Resources was founded, with the very serious intention of mining asteroids. The company, whose backers include director James Cameron and Google’s chief executive Larry Page, has already deployed its first bar-fridge sized ARKYD 100 “Leo” space telescope for prospecting purposes, and intends to deploy as many as ten to fifteen over the next few years. As they say on their website “There are no roads where we’re headed. But we have a map.” This map will significantly improve as their telescope deployments increase and the company is able to identify their optimum targets for mineral exploitation. One of the ways that we could do that is simply to turn the water on an asteroid into rocket fuel and burn it in a thruster that nudges its trajectory. 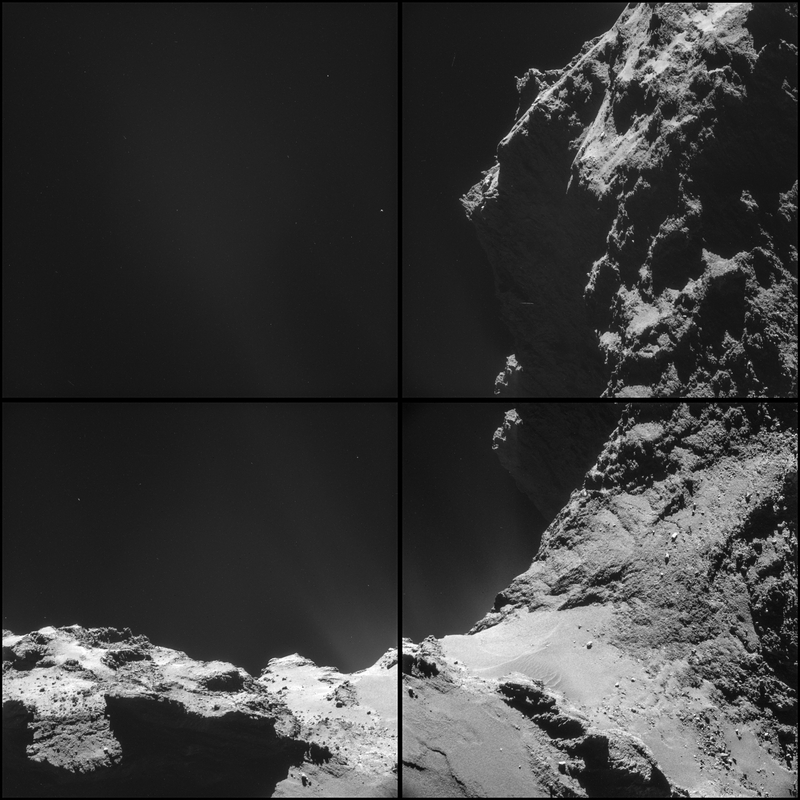 Split water into hydrogen and oxygen, and you get the same fuels that launch space shuttles. 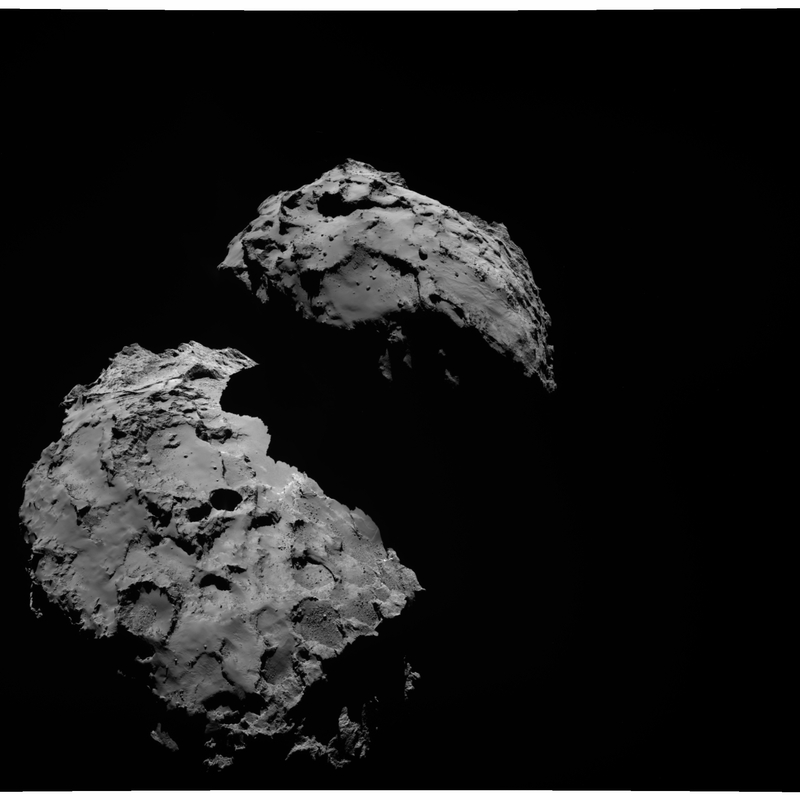 Some asteroids are 20 per cent water, and that amount would let you move the thing anywhere in the solar system. With the asteroid in orbit around the Earth or moon, journey times would become a matter of hours or days and allow much easier access for personnel. It would also make it far easier to make this a permanently crewed operation, and reduce to a manageable minimum any lag in communications. The water content of the asteroids could not only be used to enable their propulsion, but used to produce rocket fuel to refuel craft in space. Indeed, the company aims to construct a fuel depot in Earth orbit by 2020 which could refuel commercial satellites or spacecraft. How soon they will be able to begin the process of creating the fuel from an asteroid is another matter altogether, but for now it’s a case of full steam ahead. Whether or not asteroid mining proves to be cost-efficient could, to a very great degree, determine the future of human exploration and, potentially, colonisation of the solar system. Our ability to extract and refine material from other planetary bodies will be absolutely central to any attempts to establish a human presence elsewhere than Earth. The solar system is littered with asteroids, moons and dwarf planets that are rich enough in resources to sustain a permanent human settlement. Indeed, the long list of candidates for possible future outposts includes the Martian moons, Phobos and Deimos, the Jovian moons Europa, Callisto and Ganymede, the Saturnian moons Titan and Enceladus, and even the moons of Uranus, Miranda, Ariel, Umbriel, Titania, Oberon and Triton. 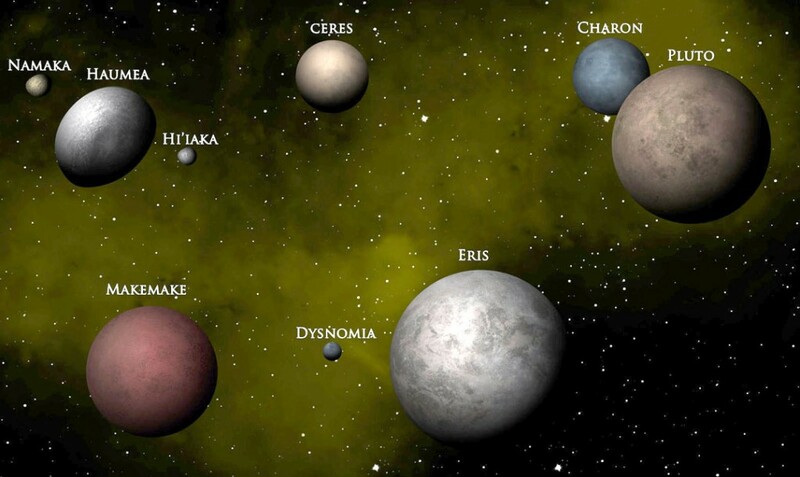 Perhaps the most suitable option might prove to be the dwarf planet Ceres, which is the only dwarf planet in the inner solar system and the largest body in the asteroid belt. With a diameter of roughly 950km and a surface area of just under three million square kilometres, it is almost exactly the same size as Argentina. 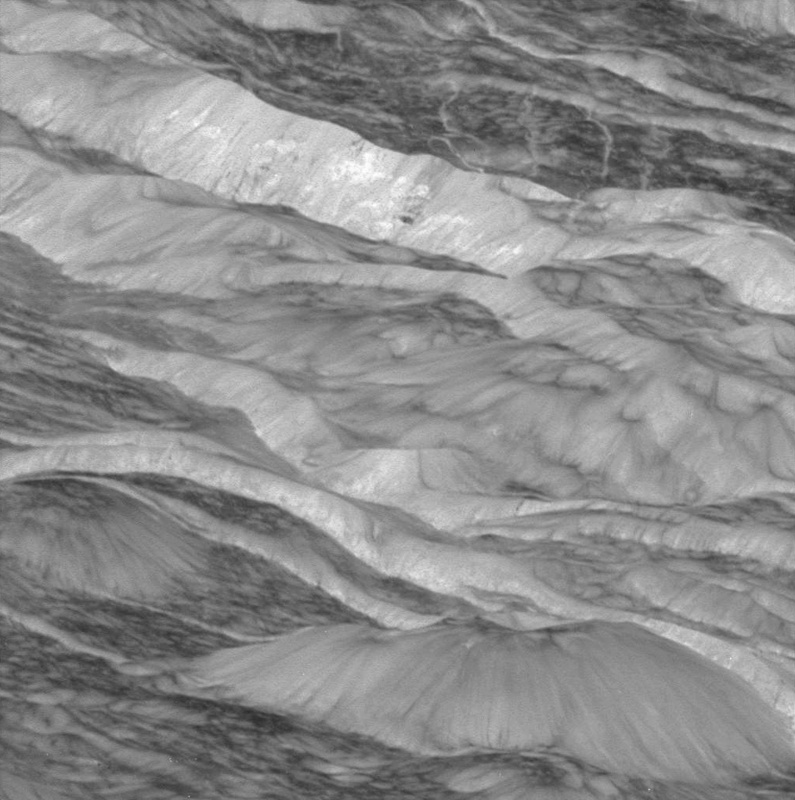 The surface of Ceres is likely a mixture of water ice and hydrated minerals such as carbonates and clays. 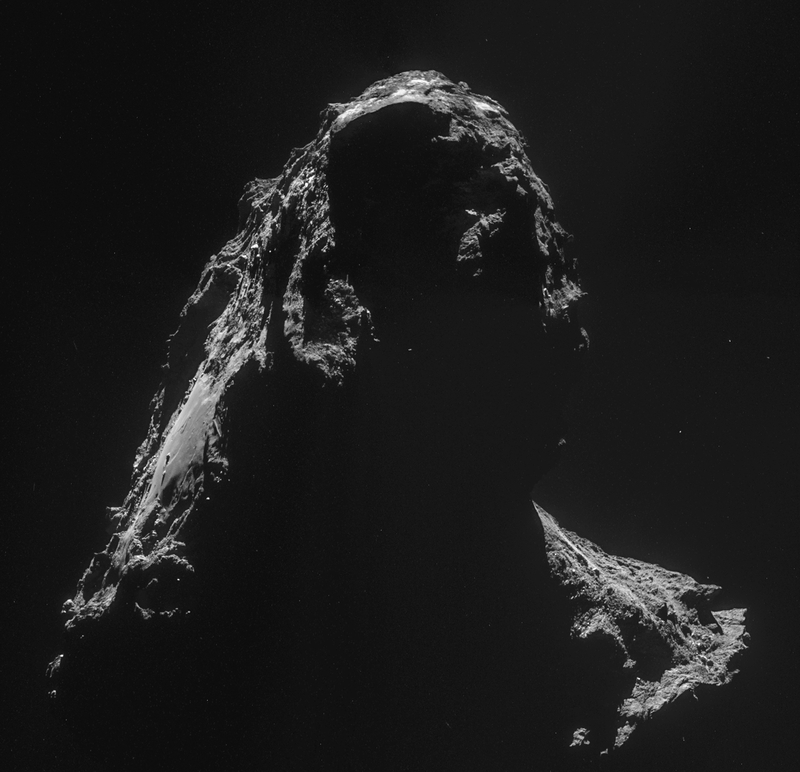 It appears to have a rocky core and icy mantle and may also have a subsurface ocean of liquid water. The highest measured surface temperature is roughly -38 celsius, making it relatively warm for such a distant body. The planet is also believed to have a very thin atmosphere. One of the great advantages of Ceres is that, despite being further from the Earth than Mars, it is, in effect, easier to reach on account of its slower orbit and thus shorter synodic period – roughly 1 year and three months compared to Mars’ 2 years and 1 month. In other words, the Earth catches up to Ceres every fifteen months or so, whilst Mars is harder to catch, and the two planets are in opposition only once every two years. With more frequent launch windows and the far lower gravity of Ceres, it would be considerably easier not only for traffic back and forth, but require far less energy to launch from its surface than from the surface of Mars. Ceres has long been proposed as the best location for a human pit-stop and refuelling station from which to explore the outer solar system, and, indeed, to mine asteroids in the surrounding belt. In 2015, NASA’s Dawn spacecraft will arrive at Ceres for a much closer look and many interested parties are waiting keenly for the wealth of detailed information we expect to receive about the composition of this dwarf planet. So it would seem that we might be at last on the brink of the long-expected expansion of human activity in the solar system. I suspect things will develop very slowly and no doubt there will be many set-backs and delays, yet the momentum is at last gathering not only for human exploration of the solar system, but potentially for the exploitation of its vast wealth of resources and, possibly, in the very long term, its colonisation. If humans can get all the resources they need to sustain their industrial capacity from space, and, possibly, their fuel and energy into the bargain, then this would very significantly reduce stresses on our own planet and potentially enable a far greener future. I’ll believe it when I see it, but I do feel at last somewhat confident that I will eventually see it.